One of the most powerful and unique aspects of Axis LMS is its ability for nearly every aspect to be automated. Post, Share, Chat & Collaborate with Learners and Participants in your LMS. I have a question. When you sit down to create a new E-Learning initiative, where do you start? At the beginning? Or at the end? If you have been using Weblearning for any length of time, you are probably used to getting 1 or 2 updates every year with a mixture of new features and interface enhancements. Our upcoming update (9.63) is due out by the end of this year, and includes dozens of enhancements (and some behind the scenes stuff), and a major rehaul of the admin interface (and probably some new course design changes as well). We realize that most of you are used to the interface the way it is (it has pretty much been the same for a few years now), so we tried really hard to keep the same workflow, while really beefing up the interface. So, I thought I would show off a hadful of screen shots to give you an idea of what it will look like (I will write another article talking about the new features). Here is an example of a Plugin subtab – we moved from list-style to icon-style rendering. Here is the Account tab (overview). We moved the tab to the right (out of your way since it is most likely the least frequently used tab in your account). This makes room for a future tab-plugin ability. Each tab and sub-tab you are on also pulls dynamically relevant articles and Q&A from the help section – this should help you along a bit if you are stuck on something (you will see those on the right panel). Of course, nothing here is finalized (we are still working on it), but what I have shown you is pretty close if not exactly what it will look like when your system gets the update later this year. Slidepoint.net Demo Presentation – No Flash Required! As you are aware if you follow this blog, we are readying the slidepoint.net online presentation site – which is a site that enables anyone to create online presentations that do not require Flash (you can sign-up free)! So of course, internally here, we have to use it and iron out any bugs and give usability feedback. So I thought I would share with you my first presentation created with slidepoint.net, entitled … Slidepoint Demo Presentation. Enjoy! One of the greatest things about PowerPoint is that they are always working to make it better. A new version means new changes. New features and options that give the user more freedom than ever before. With PowerPoint 2010 those of us in the E-Learning community have even more to be excited about. Because with this new version we finally have the ability to covert our E-Learning presentations into movies with one simple step. The reality is that it has always been possible to create a movie from a PowerPoint presentation. The problem is that up until now the process was long, laborious and complicated. It also required the use of additional software as well as some level of technical know-how. Today? This is no longer the case and I am thrilled! Now with one simple step you can save your presentation into a movie format that you can use again and again. Those of you who have Weblearning Pro or Enterprise systems, and have used the previous PowerPoint Converter tool, you may be interested to know about the new PowerPoint Converter Plug-in. 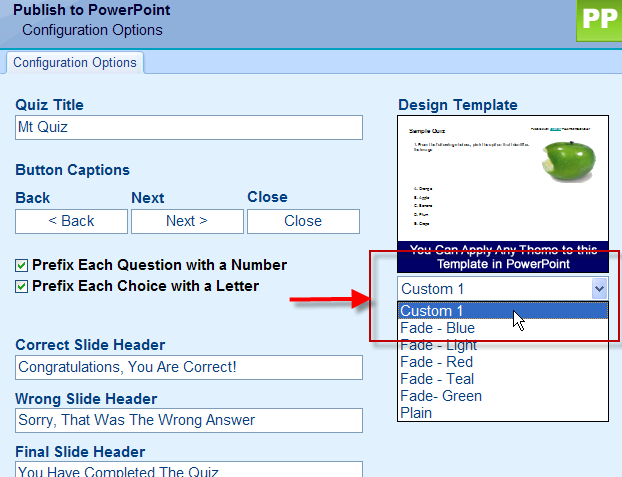 Complete information on the PowerPoint Converter Plugin (and all Weblearning plug-ins for that matter) is available here. 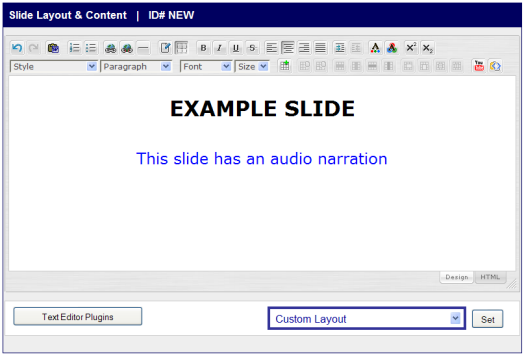 This plug-in is used to convert PowerPoint Presentation Slides into native Weblearning Slides. Minimally, this lets you get your PowerPoint presentations online without requiring your users to use the PowerPoint viewer application, and in this case, they don’t even need flash (as many PowerPoint converters turn the presentation into a flash video). This means that devices that do not support Flash (like iPhone, iPod, iPad, and many other mobile devices) will be able to view your presentations! 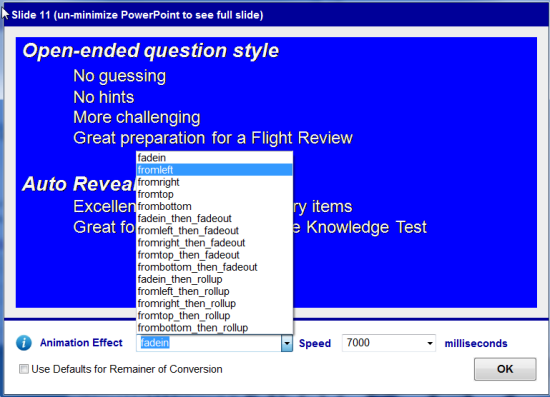 This new version of the PowerPoint Converter has many improvements over the old one. 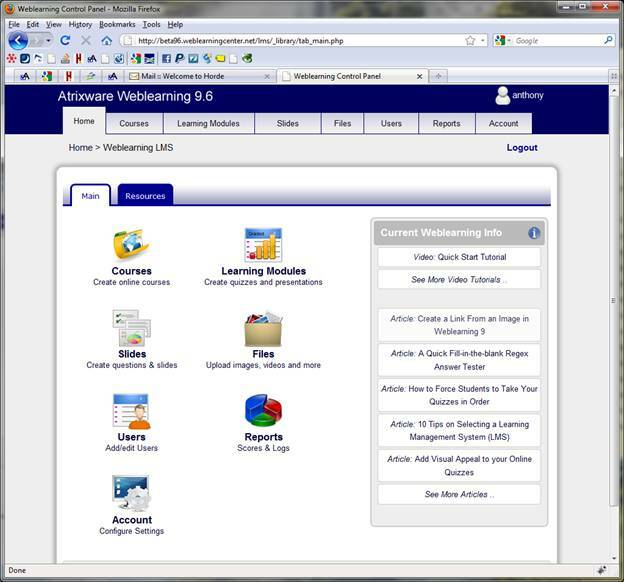 For starters, it is now a plug-in to your Weblearning system (although it still does have a desktop component to it). 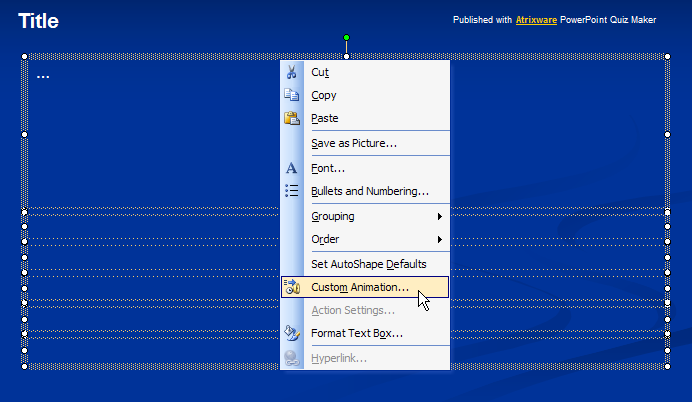 It now also converts some basic PowerPoint Animation Effects (fly-in from top, bottom, left, and right, fade-in). In addition, you can also override effects (and add some of your own) during the conversion (changing effect type and speed, and configuring items to fade out or roll-up after the core effect has completed). There is a local preview of your converted slides (along with all animations) as well. The conversion accuracy is also vastly improved, so things like stylized and non-standard-font text, multiple text colors, bullet items, and more are nearly a 100% conversion. If you would like to see it in action, you can sign up for a demo Weblearning account – then you will find the plug-in under the slides -> plugins tab. 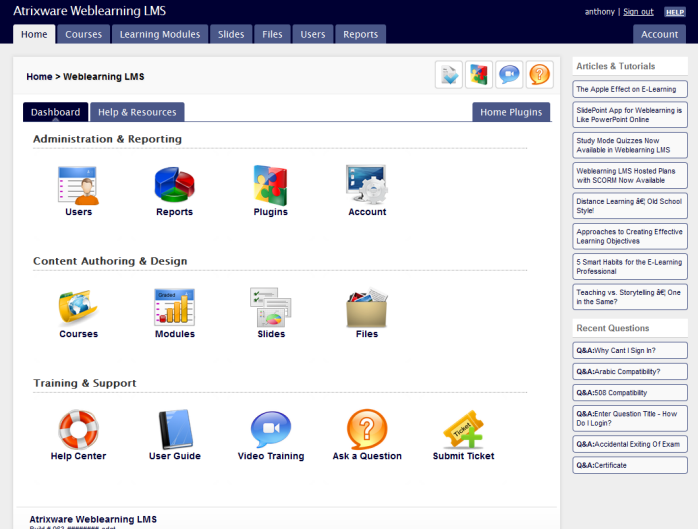 The Weblearning E-Learning System is a powerful, budget-friendly, easy-to-use Online E-Learning System for authoring, managing, and tracking online learning presentations and tests. To try it FREE, go to the Weblearning E-Learning System Sign-up Form. 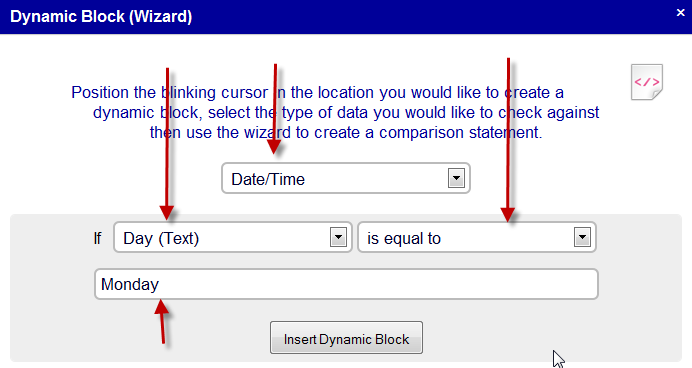 Dynamic Scripting is a new feature in Weblearning 9.6. It is quite powerful, and as you may have guessed based on the feature name, it involves ‘scripting’ (coding). However, there is a way to use the Dynamic Scripting feature without writing any code, and although you wont be able to get the full advantage by doing so, it is still quite useful. Firstly, for those of you interested in learning more details on the Dynamic Scripting feature, swing over to the Weblearning Support Page’s Product Documentation section and download the Dynamic Scripting Reference. Now for an example scenario that Dynamic Scripting would be useful. Lets say you have a 5-day course that is a combination of live training and after-class assignments. Each day, after 5pm, you would like to provide your class with access to some additional learning materials that are related to that day. 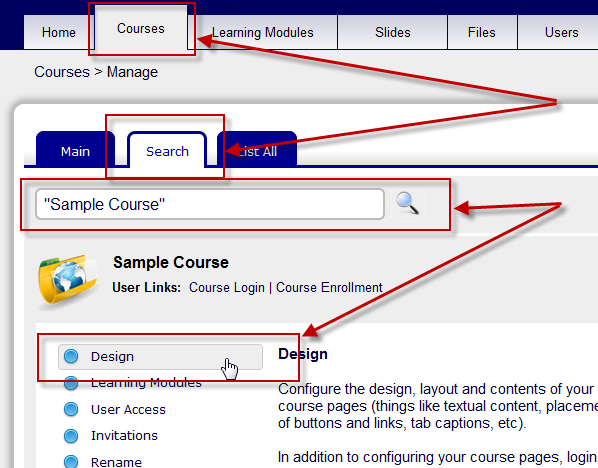 You could, of course, after each class, go into the course design area of your online course, and add/remove content. However, using Dynamic Scripting will automate the process for you, as I will explain next. This will open up the course designer. So our basic strategy is to set up 2 basic states of view (what to show if it is 5PM or later, and what to show otherwise). 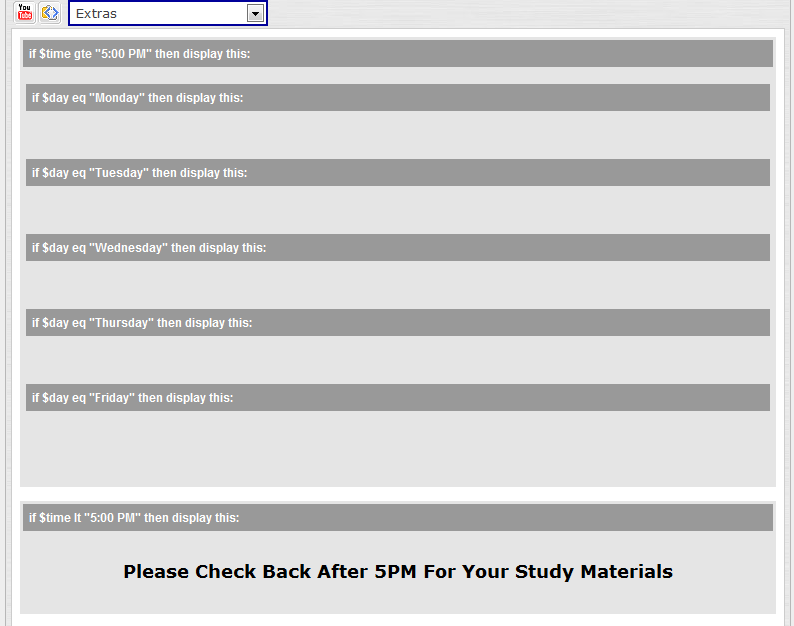 Then, in the section that is after 5PM, show different content for each day. New in Weblearning 9.6 are question and slide effects. These are a simple set of effects you can apply to your content that may add some pizazz to your quizzes and presentations (or drive your users crazy if you over-do it). Essentially, any code inside this section will execute each time this question or slide comes into view. 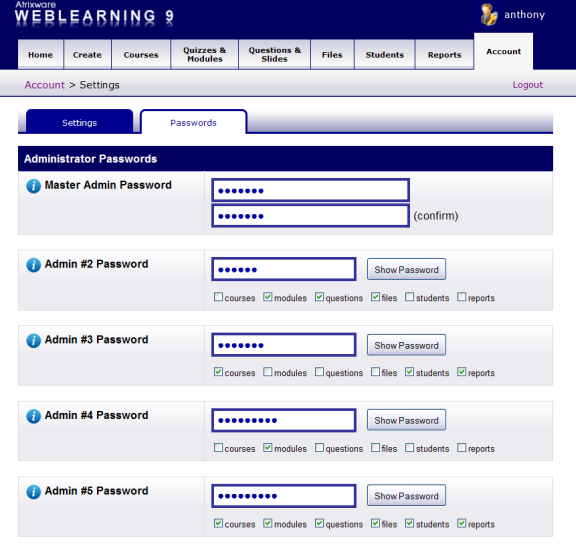 New in Weblearning 9.6 is the Master Login feature. So what does this feature do exactly? Well, if you use your Weblearning system to create multiple courses, and your users are often enrolled into multiple courses, the Master Login feature was designed for you. In a nutshell, the Master Login is a login page your users can access that (once logged in) will provide them access to all courses they are currently enrolled in. 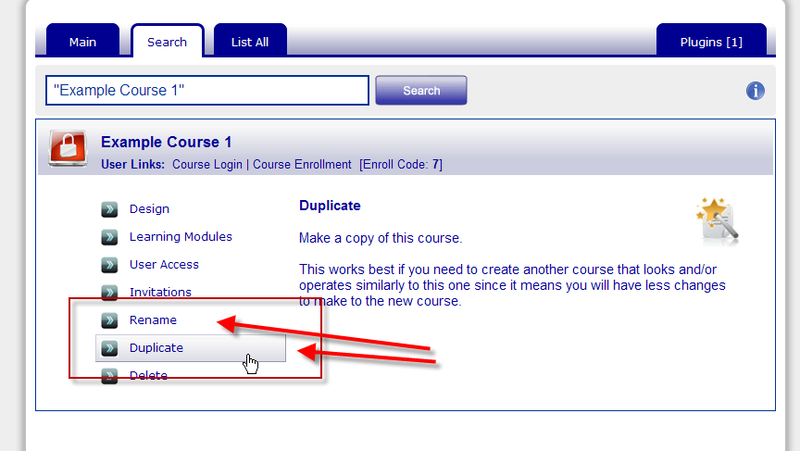 This prevents you from having to hand out multiple login links (one for each course), or, from creating a ‘master course’ that is a course simply containing links to other courses (a common way to achieve the same thing in earlier versions of Weblearning). So here is how it works. You hand out a single link to each and every user to log into (which is a link to the master login page), and they will have access to all courses they are currently enrolled in, and as you add/remove them from courses, their login will reflect that. The link is actually very simple though. New in Weblearning 9.6 is the ability to include certain question types (currently multiple-option, true/false and yes/no) inside your authored presentations. When you include questions inside presentations however, the operate a bit differently than they do inside of a quiz. First, when a user first encounters a question inside a learning presentation, the navigation buttons will be disabled – thereby forcing them to choose an answer to the question. By default, emails are sent as plain-text, and therefore the editors provided to you to change the contents of these emails are plain-text editors (no styling or sizing options like you get in, for example, the question editors). However, there is a way to force the emails to be sent out as HTML emails. 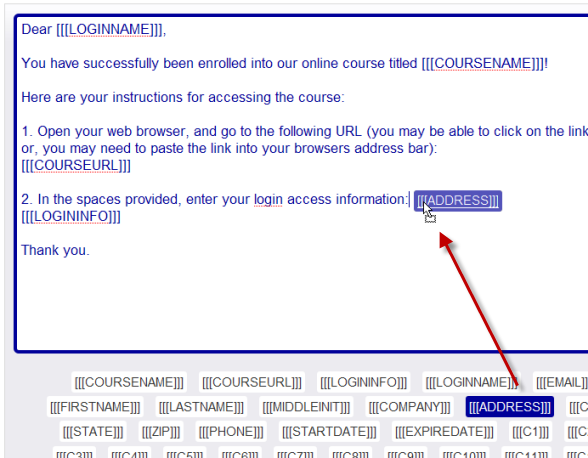 When the email function inside your Weblearning system sees this tag in the body of the email, it will treat the body text as HTML markup instead of plain text. It is important to realize that once you do this, all of the text is treated as HTML markup code. This opens up the opportunity to put formatting into your emails. For example, you can bold text (using <b> tags), change fonts, sizes, colors. You can also include hyperlinks and images – if you understand how to use the HTML markup tags for these items. Well, its been a rough week up here in the northeast. The office is closed because we are getting hammered for the 2nd time in 4 days with 20+ inches of snow, so some of us (including yours truly) are working from home. Given the circumstance, I decided to write about some more things you can look forward to in Weblearning 9.6. Again, these are all added since my last article, and are my 10 favorites since the. If you have faced this limitation, you know how huge this is. 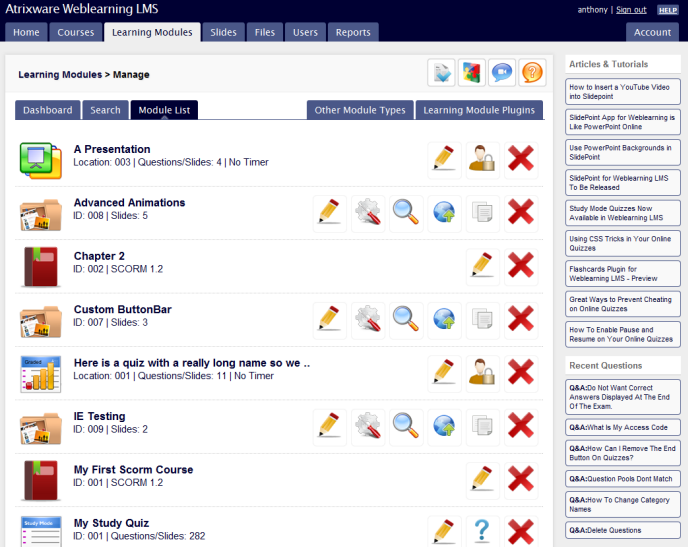 All previous versions of Weblearning had a hard cap limit of 100 total modules (quizzes/presentations) per course admin account. Weblearning 9.6 changes that.While lite and basic plans will get less than 100 (thinking maybe 10 and 30 or something like that), Pro will start at 100 (and then you will be able to scale it up (for a small fee) to as many as you need (well, actually the limit is now 9,998). The existing question preview does an OK job, but fails when your layout is complex. The new preview fixes that. 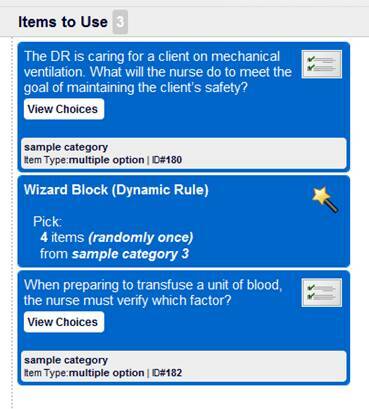 In addition, the question preview is now available from the slides tab from within a quiz or presentation (so you can see the questions inside of a particular quiz), and even lets you compare the question in the quiz against the one in the databank if the two are not the same version#. Lastly, the preview now includes the choices section for questions! 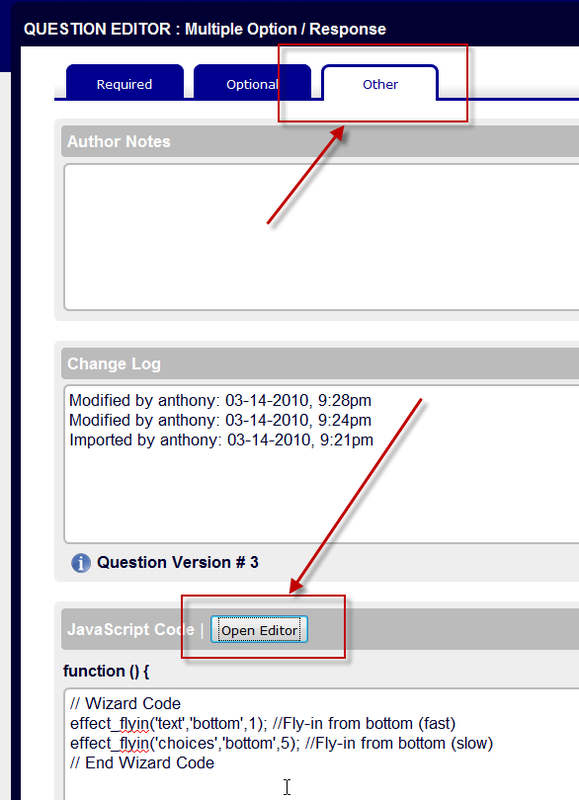 Weblearning currently has an on/off config for sharing questions and slides across multiple course admins. Unfortunately, its an all-or-nothing proposition (either all admims can view/edit/delete/use all other admins’ items, or they can’t). Weblearning 9.6 adds quite a bit of granularity. First, you can set the sharing on or off. Then, you can set parameters for whether or not the shared items can be MODIFIED or DELETED by others (or just viewed). Also, you can share/unshare items on an item-by-item basis, so you can have both private and shared items in your bank. So if you are using multiple course admins, this new system of sharing content should scale to any scenario you have. All of the emails that get sent from Weblearning (like score report emails, and course invitations) are sent in plain-text format by default (which are the least likely to be flagged as spam). However, many of you were asking for HTML email abilities. To accommodate both scenarios, you can now simply enter in the tag <html> into the template sections for each email, and they will be treated/sent as HTML. You will now be able to print off a quiz from inside the quiz properties.The print function even reformats matching and picklist questions so they print properly. This is a huge one – and after using this new version, will wonder how you ever got by before. If you incorporate a lot of content into your online courses (like images, videos, pdfs, etc), you will love the new files area. There are quite honestly too many things to mention here, but here are some highlights. Full file sharing abilities across admins, create your own folders and nested folders, perform searches for files, upload multiple files at once, and check the usage of any file. Also, when adding content into your courses, quizzes and questions/slides, you can add right from your computer (instead of having to upload first), so in one click you can browse for a file from your computer and insert it into your course quiz or slide! Currently, when you make a presentation in Weblearning 9.5, you are limited to just ‘slides’ — no question types can be used. This has changed in 9.6, where now you are able to add multiple-option, true/false and yes/no style questions into presentations. When these questions exist in a presentation, they operate a bit differently than in a quiz. 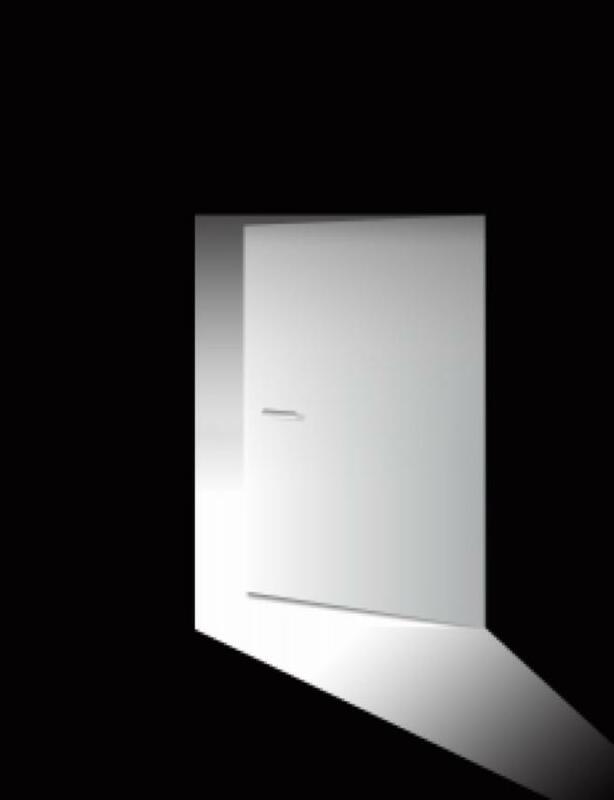 When inside a presentation, when a question is delivered, the navigation is locked (so user cannot advance), and then they are forced to pick a choice. When they pick one, they are instantly notified if they were correct or not (along with feedback you can enter for each individual choice if you want). It is only when they answer correctly that the navigation is re-enabled. Slides get two new settings – entrance animation (fly-in from top/bottom/left/right slow/medium/fast), and navigation settings (lock navigation for 5 seconds to 10 minutes (to force users to spend a certain amount of time per slide/per presentation), and and auto-advance to next slide setting so you can auto-advance them from slide to slide without them having to click anything). Questions get the same entrance animation options, but the question text and choices section can each have its own animation setting (so for example, you can have the question text fly in from the right, and the choices section fly in from the bottom). I have talked about the plugin architecture in the other articles, but we just recently implemented this into Quizzes and Presentations. What it means is that you can incorporate plugins (code) into presentations and quizzes too, making them much more scalable. 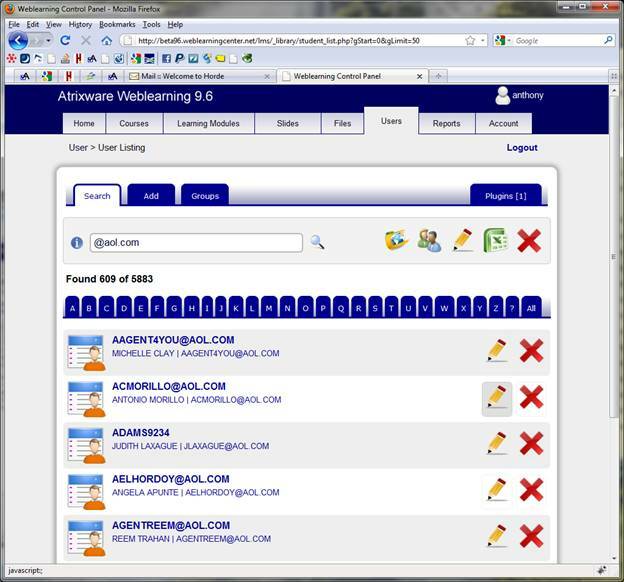 If you are a current user of Weblearning 9.5, and are interested in a demo account on the beta server, email me at anthony @ atrixware.com and I will get you set up. 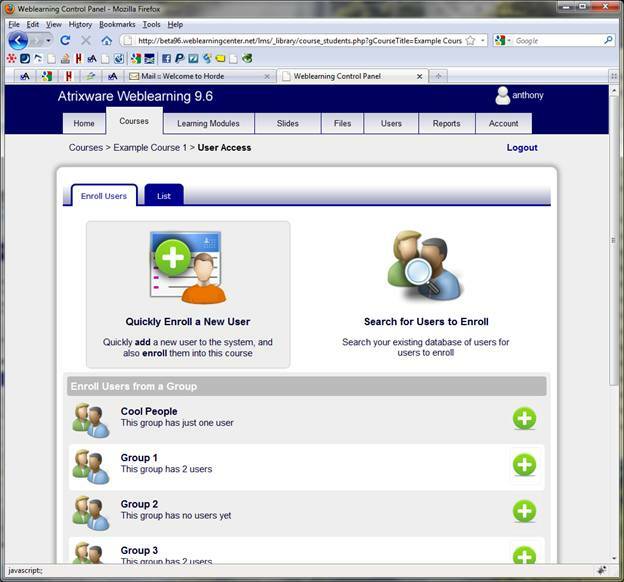 As I sit snowed in to my home office on a Saturday, I figured I would post some screen shots of the new Weblearning 9.6 interface. 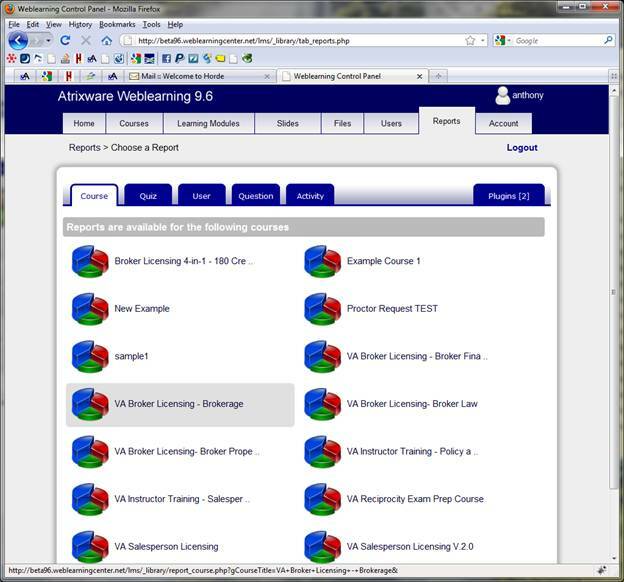 Note that these are screen captures of the in-development build of Weblearning 9.6, so some minor things may change, but if you are using 9.5 now, you will notice major changes (and improvements) to the interface, while still maintaining the same ‘feel’ of 9.5. So this will be a photo-only article (no captions, no comments), but I made sure to put a few screens in here that show new features that I have not yet posted about – hope you like it! It has been about a month since I last posted the first sneak peek on Weblearning 9.6. As promised, I wanted to tell you about some more things that will make it into the 9.6 release. As before, there’s quite a bit, so I have to be somewhat selective to keep this article short. Currently (in version 9.5), you can create up to 10 ‘rules’ to pick questions, something like “Pick 5 questions from category 1“, and then “Pick 3 questions from category 2“, etc. Once you hit 10, that’s it. 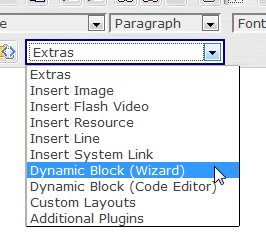 Now, there is no limit, thanks to the new wizard block functionality. That’s right. You can pick individual questions one-by-one and place them into your quiz or presentation. Looking to create a quiz with 10 specific questions? Not a problem anymore. 3. Your quizzes and presentations can be a mixture of BOTH individually-selected and randomly-selected questions and slides. For example, you can set your quiz up to pick 3 specific questions, and also 10 random questions from category 1, and 3 questions in sequence from category 2, and then 5 more specific questions! 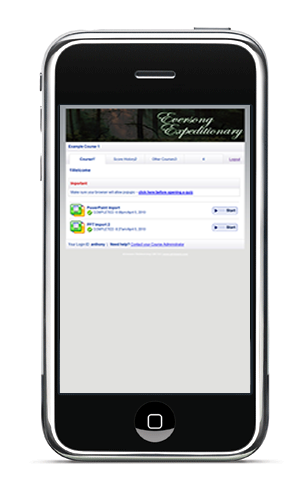 One of the big feature requests – the ability to republish a quiz or presentation without losing any settings. Its here. Here is how it works. You update some questions in your question bank – and then you want the updates to propagate into your quiz. So you simply click the CREATE OR REPUBLISH A QUIZ, then pick the quiz you want to republish, and then click PUBLISH! Thats it! Questions/question rules are remembered, and all settings as well. Of course, you can also swap out a few questions, change the order around, etc before republishing if you choose. 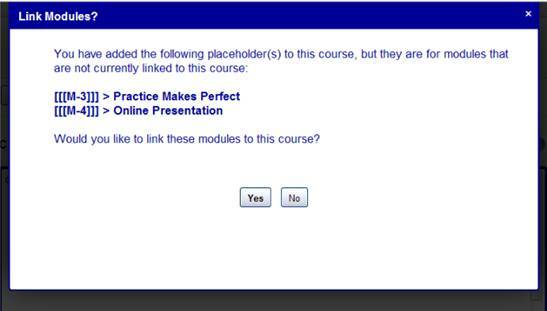 When you are in COURSE DESIGN view, and adding placeholders for individual modules that do not yet exist in the course, Weblearning 9.6 will detect it, and ask you if you want to automatically link those modules to the course, saving you the extra steps of manually adding them. All question editors have been re hauled for easier use, and a few of them (like multiple-choice and matching) get a few new usability features. 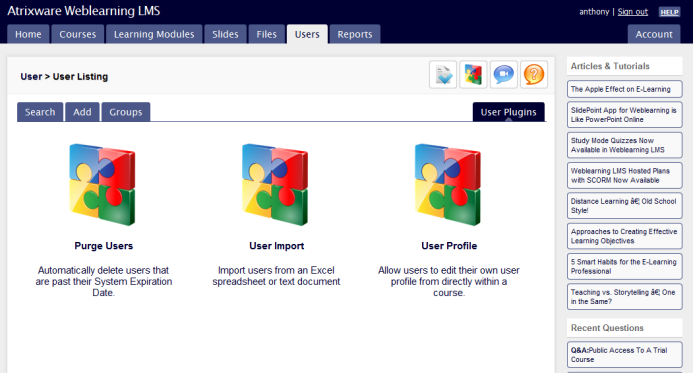 A lot of work has gone into making user (formerly named student) management easy. 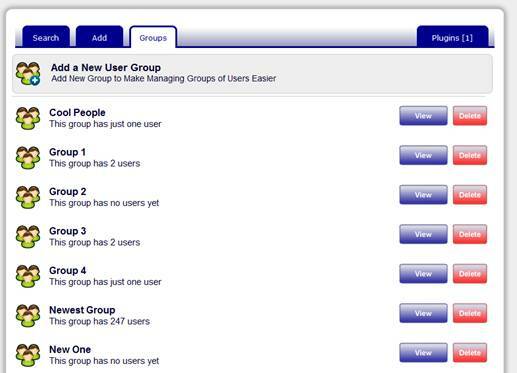 One new feature is the ability to create user groups, and then place users into them. Then its as easy as 1-2-3 to do things like enrolling/dis-enrolling groups of users, changing user information across all users in a group (like start/expire dates, or custom field values for example), and more. Previously, you had access to a user’s login id in all places that use placeholders. Now, wherever you have access to the user id placeholder, you also have access to every other data field for that user (like name, address, company, etc, and even including the now 15 custom fields). 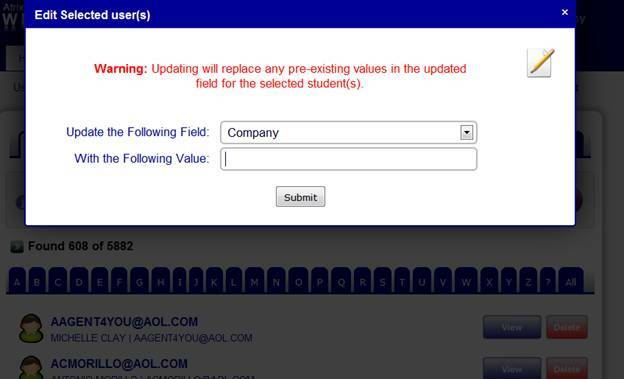 The new search functionality for users (where you can, for example, list all students from COMPANY:Microsoft or that have an @aol.com email, or live in NJ, and dozens of others) also lets you APPLY functions to the resultant list of users. For example, if you wanted to CHANGE all users from COMPANY:Microsoft to be COMPANY:Apple, no problem. Or how about DELETING all users from COMPANY:Microsoft, or maybe putting all users from COMPANY:Microsoft into a user group named MICROSOFT EMPLOYEES or enrolling all of them into the WINDOWS 101 Course. No problem! The new plugin architecture (mentioned in my previous article) will work with another new feature – tasks. 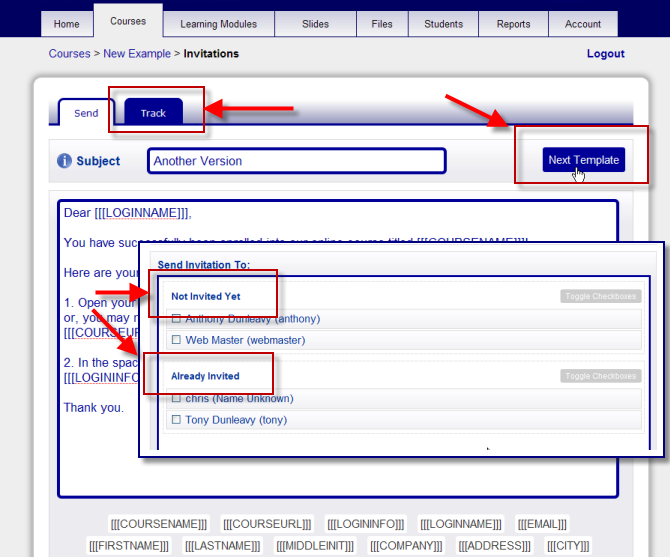 A task is a script that runs automatically 1x per day (or you can initiate it manually from your course admin panel). The script can do anything you want (by default it does nothing, but it is designed to run plugin-scripts). What does it all mean? Well, for example, lets say you wanted to have a report run 1x per day that tells you which users were active? Or you wanted to automate the emailing of a score report to a particular person. As long as you can write the plugin to do the work (or have us write it for you), the tasks function will run the script! There are a few more MAJOR items that are planned for the release that I can’t comment on yet (because they are not fully finished), but I can assure you, there’s some other cool new stuff to be part of version 9.6 that you will love! I will try to get in another post in about a month with another list. 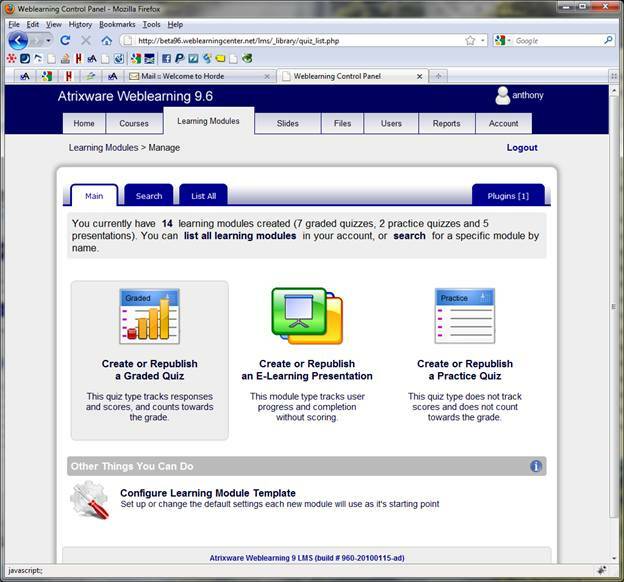 We have been hard at work on the next update to Weblearning – version 9.6. We are still a few months or more away from release (it’s scheduled for a Q1 2010 release), but there are so many new and cool things that will wind up in this new update, I thought I would mention a few. There are actually around 100 new features and changes planned for version 9.6 (many based on your suggestions and requests since 9.5 was released in January 2009), but I will only cover the ones that are almost guaranteed to be in the final release (meaning they are done already and working), and from those, I will only mention a few (just my favorite ten ~ although almost 50 new features and changes are done so far). This is a big one ~ and what it means is that when your students are inside online quizzes and presentations, their progress is auto-saved (at pre-determined intervals which you can specify). If they lose connection, or have a power failure, this feature will be a lifesaver! You can now assign a timezone override to the server time so reports will have the time and date based on your time zone. This also includes the ability to customize time/date output (so for example, you can display dates like this: 12/25/2009 or like this 12-25-09 or like this December 25, 2009 or like this Friday, December 25, 2009 (or really any way you want). Do you use the same Course layout and configuration for every course you create, but are tired of having to edit each new courses with your same desired content? Course Templates will enable you to set up a course template so each course you create will use it by default! When inserting placeholder text into your emails, page layouts, etc, all of the placeholders can now be dragged & dropped into place, making it a snap! Lock down your content and apply preventative measures to deter users from stealing your content ~ it’s as simple as selecting YES to enable the protection! Do you want to assign someone to do just authoring of questions, and someone else to pull reports? Version 9.6 enables you to assign up to 4 additional passwords to your account, and specify which areas of your account they can access! Re-use previous invitation body texts and subjects (they are automatically saved), track who was already invited and who wasn’t, and even pull up the exact email invitation that was sent to each person, along with time and date. Finding students couldn’t be easier. Search by any field (including up to 15 custom fields now in version 9.6), or ALL fields, or by UserGroup (new in 9.6), or course they are enrolled in. Exporting and deleting can be applied to the results. Want to send your students to a single login to access all of their courses (instead of having them log into each course individually)? Version 9.6 offers the master login page. Ok – I cheated, and added an 11th one to the list (couldn’t resist). 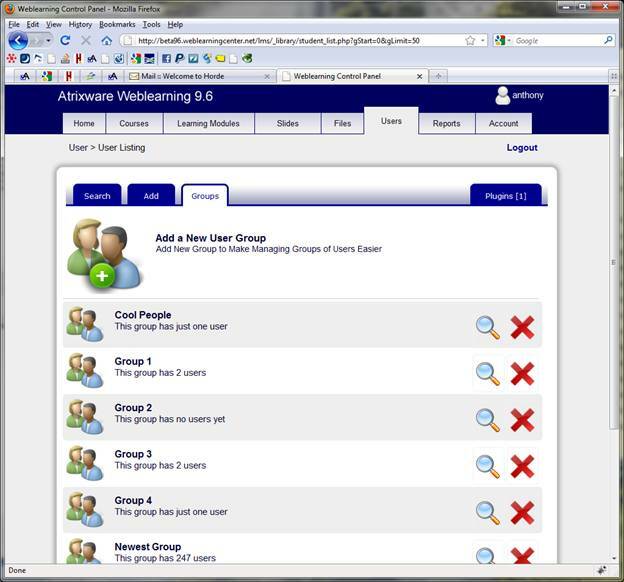 The new plug-in system is a huge addition to Weblearning. 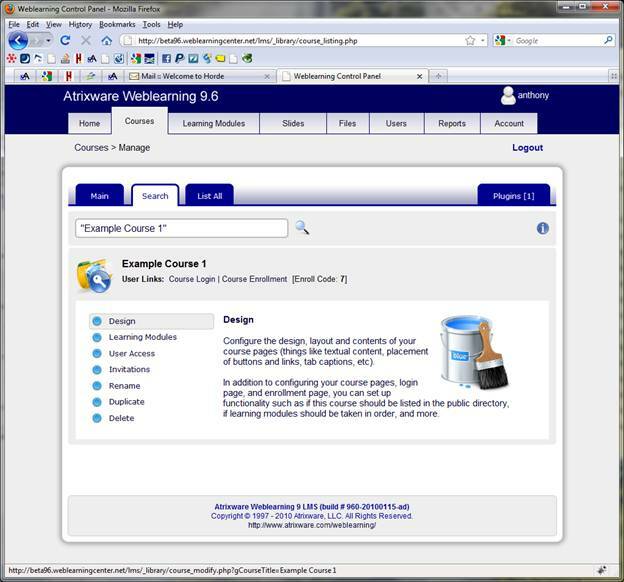 It has a plug-in system for the course admin interface (shown in image below ~ see the PLUGIN tab), as well as the course portal interface , and is the gateway to dozens of add-on components in the years to come, in addition to making it easy for us to add in customized functionality to your server without having to modify core files. It also makes it possible to incorporate other web components and applications into your courses that are not designed specifically for Weblearning. As you may have realized, this new update is a massive release, not to mention a rehaul of the visual interface (we are constantly cleaning it up and trying to make it more usable). Of course as a Weblearning user, you get it FREE! I will be back in a month or two with another list of my next favorite 10 things as we approach the release date. Thanks! SCORM Quiz Maker is an application that lets you easily create quizzes that can be uploaded into your SCORM compatible LMS. It also allows you to make Microsoft Word compatible printed quizzes and answer keys as well. It shares the same authoring interface as our other quiz maker products (like Easy Quiz Maker and PowerPoint Quiz Maker) and shares a common import/export format for multiple-choice questions (so you can, for example, use your questions across all products). As a preview of what can be published using SCORM Quiz Maker, I’ve published an example SCORM compatible quiz and a sample printed quiz. 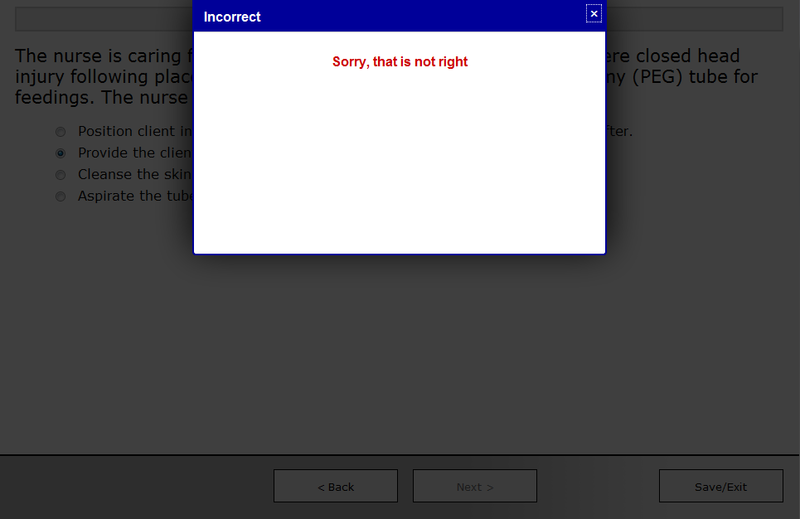 To preview this SCORM compatible quiz example, click here. 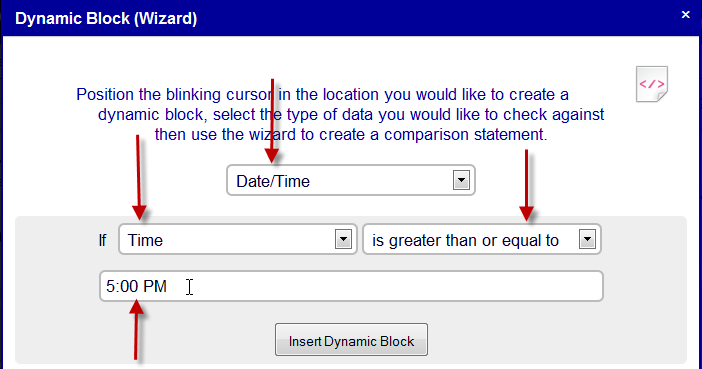 Note that not all features will be available when you run the quiz locally as opposed to on your LMS. If you are using Internet Explorer, you may need to click the top bar on the browser, and then choose ‘allow blocked content’ — note that this will not appear when the quiz is delivered from your LMS. 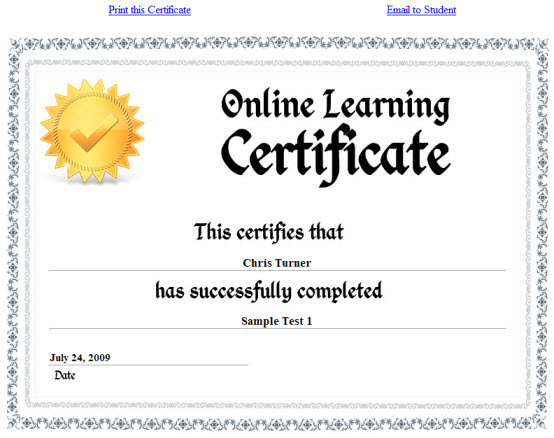 This is an example of a printed quiz created with SCORM Quiz Maker. I’ve printed the quiz to a PDF document so that you can download and open the example locally and see how SCORM Quiz Maker can also be used to deliver your questions in a classroom setting. To view the printed example click here. For more information on SCORM Quiz Maker and it’s features, please visit the SCORM Quiz Maker page located under the Products section of this website. 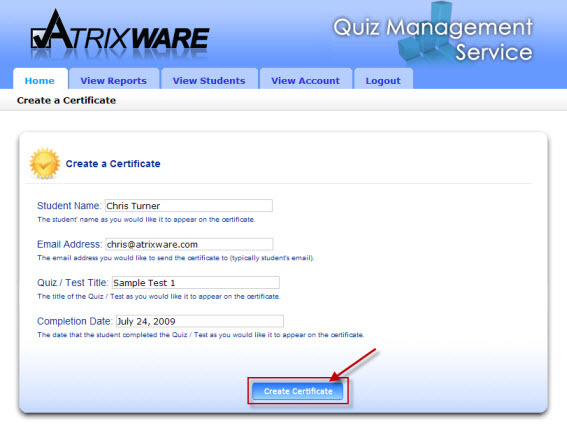 It’s easy to create, send, and print certificates for your students using the Quiz Management Service. By just entering a little bit of information about a student, you can easily generate a certificate that can be printed directly from your web browser or emailed to yourself, the student, the student’s parents, or anyone else with a valid email address. Using the Quiz Management Service’s certificate feature, you’re not limited to sending certificates to only students who have completed quizzes in the QMS – you can send certificates to any of your students by just entering their data. In this article I’m going to walk your through how to create, print, and email your first certificate. To get started, log into your QMS account and click on the Create Certificate button located on the home page. Clicking on the Create Certificate button will open up the Create a Certificate screen. 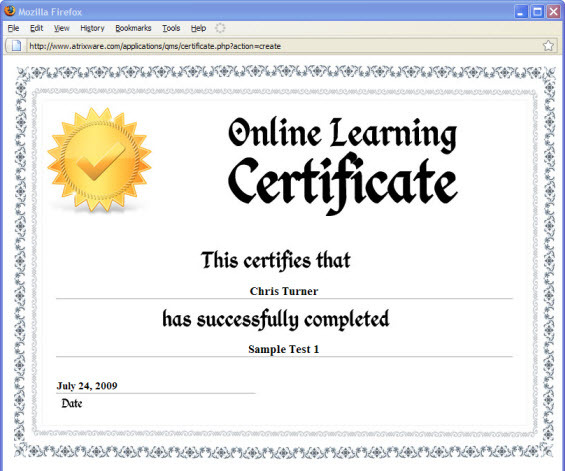 On this screen, you will be prompted to enter the name of the student (as you would like it to appear on the certificate), the email address where you would like the certificate sent, the name of the Quiz / Test (as you would like it to appear on the certificate), and the date of completion (as you would like it to appear on the certificate). 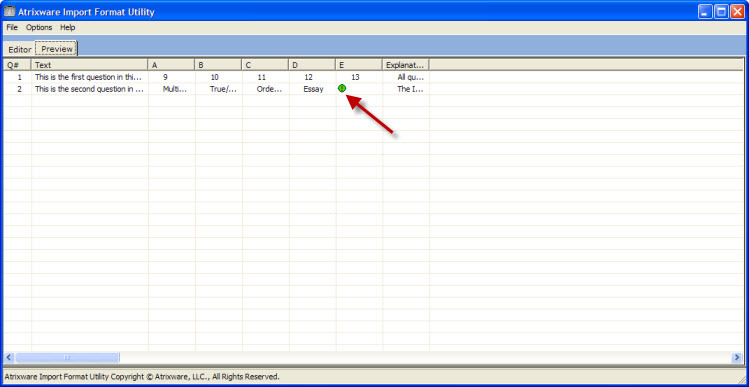 By default, the current date will automatically be filled in for the date of completion. Once you have entered each of the required pieces of information, click the Create Certificate button to generate the certificate. After clicking the Create Certificate button, your student’s certificate will automatically be generated and displayed for you in the browser window. To print the certificate, click the Print this Certificate link located above the certificate. This will open the certificate in a new window (or tab, depending on the browser and settings you are using) with no other content than the certificate itself. To print the certificate, select the Print option for your browser. To email the certificate to the email address specified in the previous step, click the Email to Student link above the certificate. 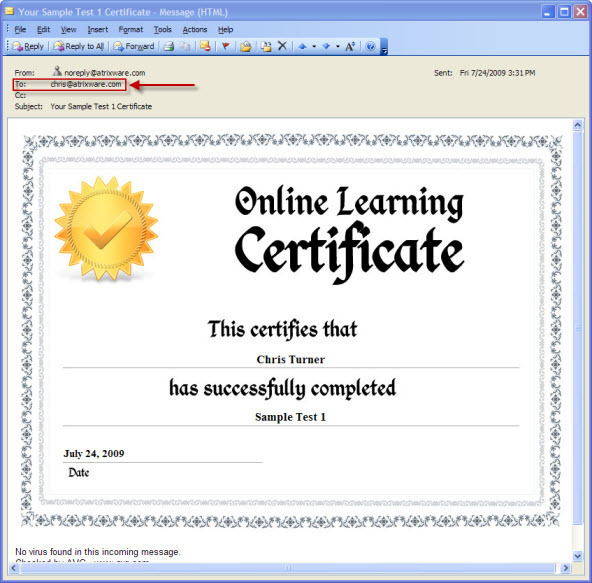 The certificate will then be automatically be sent and a message will be displayed indicating that the certificate has been sent. The student (or whomever owns the email address you entered to receive the certificate) will receive the certificate as an email, which they can then print out and/or save for their records. To send another certificate or to return to the QMS Home Page, click the Home link from the menu bar at the top. 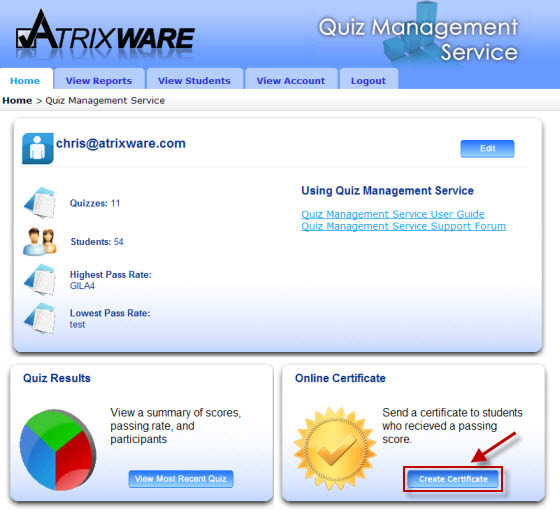 The Quiz Management Service is compatible with PowerPoint Quiz Maker, Easy Quiz Maker, Flash Quiz Maker, Online Quiz Maker, and Test Pro Developer. In the latest patch to the Weblearning 9.5 LMS, we added (among other things) the ability to add audio narrations to your quiz questions and/or presentation slides as part of the new Text Editor Plugins Toolbar. To begin, first record and then upload your audio narrations into the FILES tab (note: make sure the narrations are in MP3 format). Once the mp3 files are uploaded into your account, you will easily be able to attach them to your questions or slides (as I will describe next). The audio plugin will appear. Simply choose the mp3 file to insert, and check/uncheck the AUTOPLAY checkbox, and choose the color of the player (keep it at auto-color for maximum compatibility with all the different skins you may apply to your quiz or presentation). Note the audio play bar along the bottom left of the presentation. It contains a Play/Pause button, and a moving bar indicating how far along the audio is from the end. If you have set it to auto-play (as I did in this example), the audio will begin playing when the slide is in view. Otherwise, the user can start the audio by clicking the PLAY button (which turns into a PAUSE button when the audio is playing). 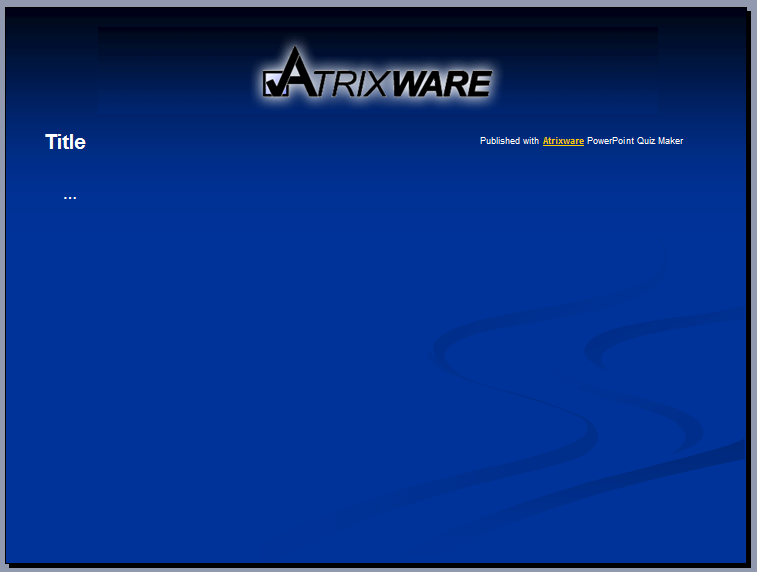 The newest version of Atrixware PowerPoint Quiz Maker uses design templates for the resultant presentation. For the most part, the included templates are usable, but with just a bit of work, you can create your own, and add in your own logo, graphics, font sizes, and transition FX (as a small example). 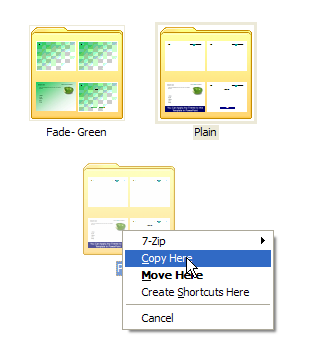 Now, COPY a folder (I will use PLAIN in this example), and then PASTE it so there is a new folder .. 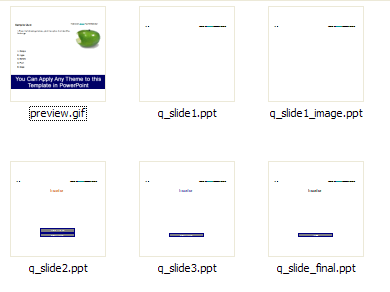 The preview.gif file is what you see in PowerPoint Quiz Maker when you choose the design template. If you have a graphic editor, you can change this to whatever you desire. For this example, we will use the default preview. 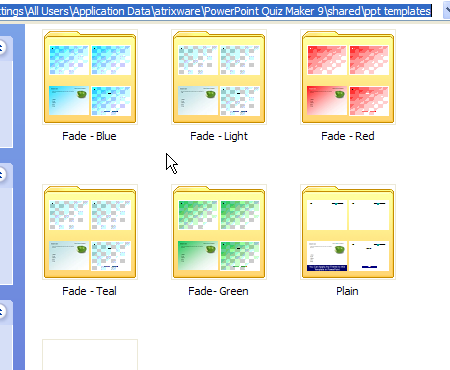 The other 5 files are used by PowerPoint Quiz Maker when it creates the PowerPoint quizzes. You can modify one, or all of these files inside of PowerPoint. The important thing is to NOT remove any elements already there, or the quiz may not work properly (but you can certainly ADD elements and MOVE elements around). For this article, I will modify the q_slide1.ppt, which represents the slide that contains the question text, and choices for questions that do not have an image (for questions with an image, the q_slide1_image.ppt is the template). 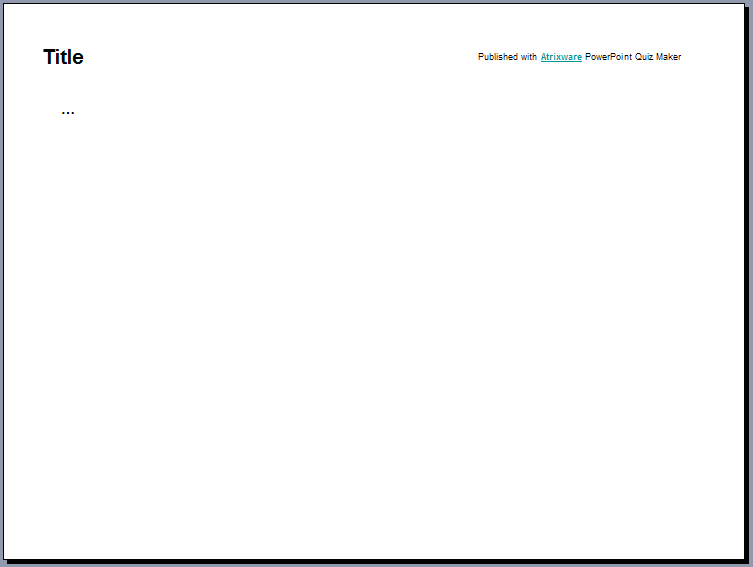 So, double-click on the q_slide1.ppt file, and it will open in PowerPoint. 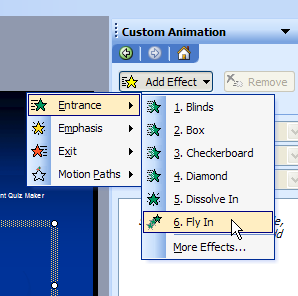 I also added an entrance effect to the question text and choices by selecting each one (6 total fields) and then right-clicking and choosing CUSTOM ANIMATION ..
.. and then choosing ADD EFFECT > ENTRANCE > FLY IN ..
One of the most frequently addressed questions we come across is on the topic of importing questions into our Quiz/Test software and Weblearning application. More often than not, the trouble lies within the formatting for the text file itself. 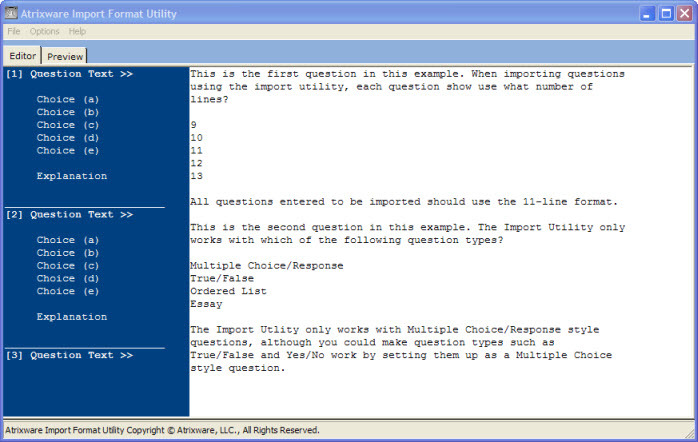 In this article, I’m going to show you how to properly format your questions and load them into the Import Utility so that they can easily be imported into our software. Before we get started, it’s important to note that the Import Utility only allows you to import Multiple Choice/Response style questions. Any other types of questions (Fill-in-the-Blank, Essay, Pick List, etc.) will need to be added in manually. The first step is to launch the Import Utility itself. Depending on the type/version of the software your using the process for doing this may vary. 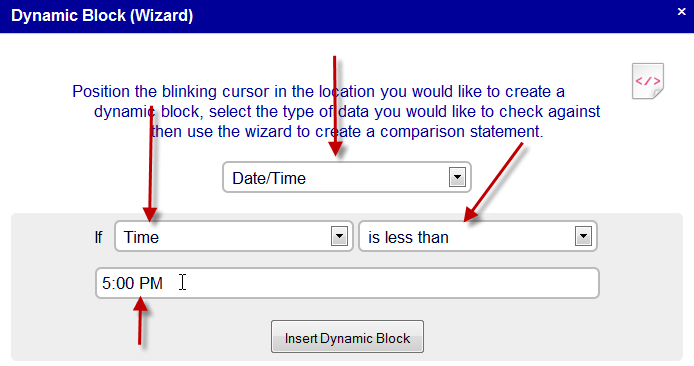 In most cases, you can launch the Import Utility by going to the Questions area of the quiz/test you are currently working on and locating the Import link, bringing up the Import Wizard. On the first step of the Import Wizard, where you would normally select the .txt file you would like to import questions from, there is a link that reads Launch the Import Utility (click here). In some cases, you can launch the Import Utility by going to the Tools menu at the top and selecting Question Import Utility. In Weblearning, you can launch the import utility by following the instructions in the Import section of the Questions & Slides tab. This will launch the Import Utility, which allows you to open the text file containing the questions you would like to import, and format the text file into the proper format for importing. 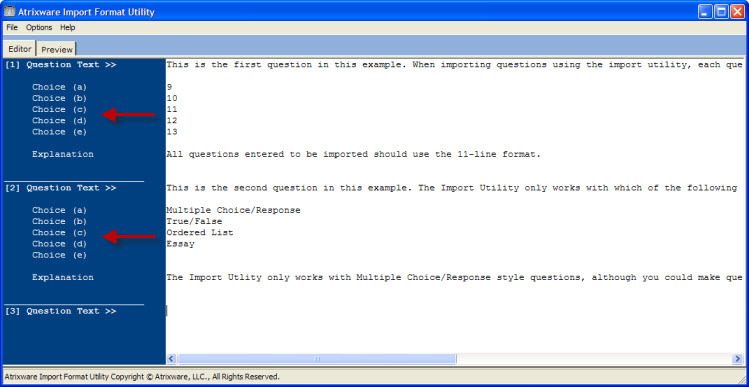 Each question that you import should follow the 11-line import format. The first line must contain the question text, followed by a Hard Return, then a blank line (if your question or answer text contains line feeds/carriage returns, replace then with the following markup prior to importing: [br] ). The next 5 lines are answers A-B-C-D-E, each followed by a Hard Return. If a question has less that 5 answers, enter a blank line (Hard Return) for each missing answer. After the 5 answers, another blank line should follow. Next, the explanation should follow, then followed by a hard return, and then 2 blank lines. 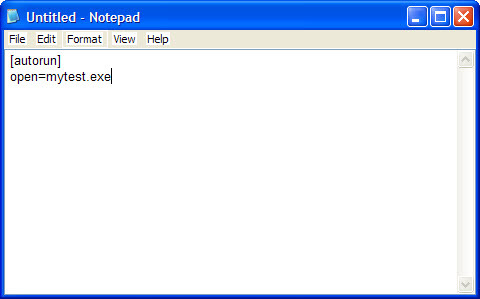 As you can see, the questions from my text file do not match the 11-line import format. To verify that the lines are off or to view what types of errors I may have in my text file, I can click the Preview tab at the top to get a question by question analysis of exactly what (and more importantly how) questions will be imported. First and foremost, both of my questions are using more than one line, when they should only be using one line. In my second question, the explanation is also using more than one line when it should be only using one line. Also in the second question, I only have four answers (which is OK) but I have not left a blank line where the 5th answer would normally be. In fact, I’m missing a second blank line after both explanations as well. All of these things together are causing my question errrors. This time around, I did not recieve any popups notifying me of any errors, and I only see one warning sign. In this case, the warning sign is alerting me that I have not entered any text for the 5th answer of my second question – which I did intentionally so it appears all is well. 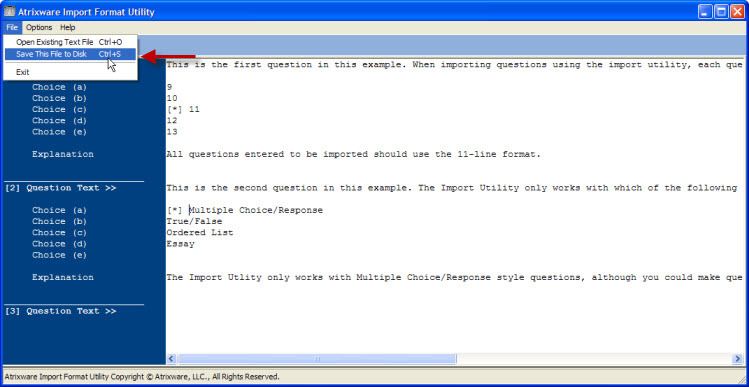 Note: This step can be skipped, however if no prefix is found the Import Wizard will automatically use the first answer as the correct answer. Now that my text file is in the correct format, it’s time to save my text file again so that it may be used by the Import Wizard. To do this, select File > Save This File to Disk from the menu at the top and select the location and filename where you would like to save your formatted text file. Once my .txt file is saved, I’m ready to return to the software and follow the steps of the Import Wizard, using my newly formatted text file to easily import questions, answers, and explanations directly into the software. 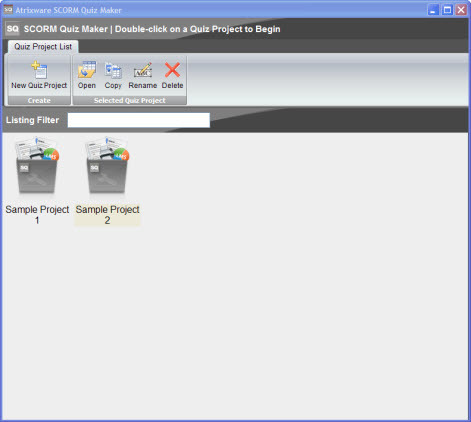 Easy Quiz Maker 9 has changed the way it handles printed quizzes. In previous versions of the software, each time you created a Printed Quiz, you were actually creating a finished document that could be printed or opened in Microsoft Word. By publishing another Printed Quiz with the same set of questions you could create another quiz based on that same set of questions, but it required knowing exactly which questions from your Question Bank were used when creating that first quiz. 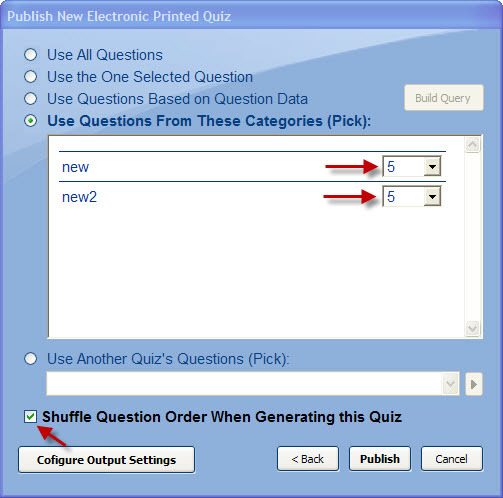 Easy Quiz Maker 9 has made it easy to create new Printed Quizzes based off the same question selection rules used by an existing quiz. This comes particularly useful if you wanted to create variations on the same quiz. If you’re using Printed Quizzes, chances are you’re delivering your quizzes in a classroom enviroment. You want each student to have to answer the same exact set of questions, but perhaps you don’t want two students who are sitting next to one-another to have the same exact quiz in the same exact order. That’s where Quiz Variations come into play. 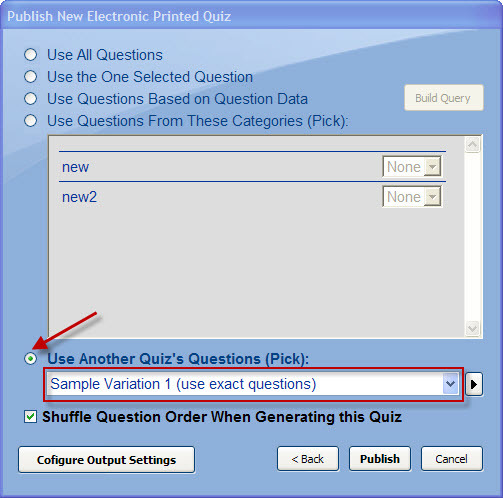 You can easily create one, two, or more versions of a Printed Quiz using the same exact questions, however have each version of the quiz present those questions in a different order. 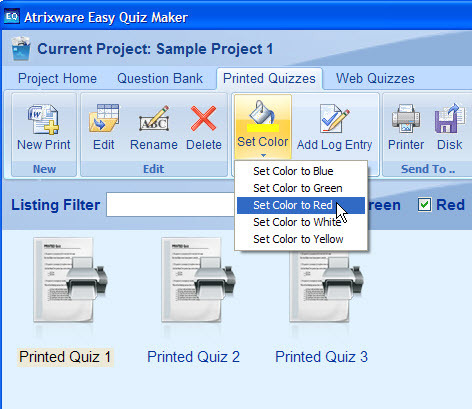 To get started, go into one of your Quiz Projects and then click on the Printed Quizzes tab (this tutorial assumes that you already have a Quiz Project created and have added questions to it). The first thing we’re going to do is create a Printed Quiz that we can consider as a “base” quiz – you can think of the this as the first variation of the quiz. To do this, click the New Print button from the toolbar. After you’ve clicked the New Print button, you’ll be asked to enter a Short Description (for mine I’m going to put Sample Variation 1). After you’ve entered the quiz description and clicked the Next button, you’ll be presented with the question selection screen. Here you can choose to select all questions from your question bank, just the currently selected questions, questions based on their question data, or questions based on their category. For my quiz, I’m going to choose to add 5 questions from each of my two categories, and for those questions to appear shuffled in my printed quiz. Once you’ve finished configuring how I would like to select questions, click the Publish button to finish creating this new quiz. The new quiz will appear as an icon with the rest of your Printed Quizzes. Now that we’ve created the first of our quiz variations, it’s now time to create a second quiz that will use the same questions as the first quiz only presented in a different order. 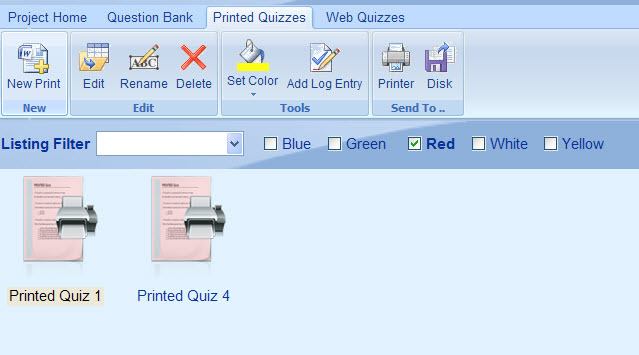 Once again I’m going to click on the New Print button in the toolbar to create another Printed Quiz. This time when it asks me for a Short Description I’m going to enter Sample Variation 2, indicating to me this is another variation on the same quiz. After entering my description and clicking the Next button I’ll be brought to the question selection screen once again. This time however I’m going to select to Use Another Quiz’s Questions and from the dropdown box select the name of the quiz that I would like to draw questions from. 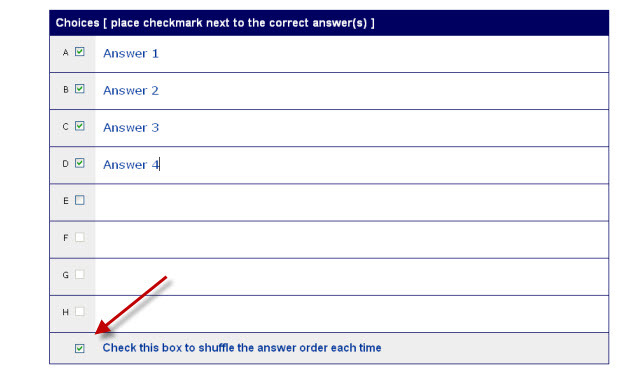 When selecting the quiz, you’re given the option to either use exact questions or use same selection script. If you choose to use the exact questions, you will get exactly the same questions as you used when creating the original quiz. If you choose to use the same selection script, the quiz you are creating here will use the same question selection rules as the first quiz (if I was to choose this here, I would create another quiz that pulls 5 random questions from each of my categories but not necessarily the same questions). In my case I want to use the same exact questions, so I’m going to select Sample Variation 1 (use exact questions). I’m also going to make sure I leave the Shuffle Question Order box checked to make sure that the question order gets shuffled. 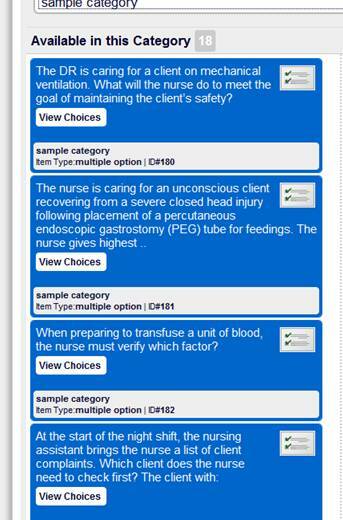 Once you’ve selected how you want this variation to work, click the Publish button to create the new quiz. Now in my Printed Quizzes tab I’ll see both quizzes I’ve created. Even though they both use the same exact question, the order that those questions are presented are different between the two quizzes. If I wanted to create a third quiz, I’d follow the same steps I used to create the second one. Now when you distribute these quizzes to your students, you can have three different quizzes on the same subject matter – each with there own answer key. Easy Quiz Maker 9 has added a new level of tagging and sorting both your printed and web quizzes to make organizing your quiz projects that much easier. There are five different color tags available to use – Blue, Green, Red, White (the default), and Yellow. To get started using the color tagging feature, we’ll assume you already have a quiz project set up and have a created a few Printed Quizzes. To tag a quiz as a certain color, click on the icon for the quiz you would like to tag (highlighting it), then click on the Set Color icon for the toolbar at the top. When you click on the Set Color, you’ll be presented with the 5 different color options available to you. Simply select on of those colors from the list. As you can see from the picture above, I’ve tagged two of my quizzes red, one of my quizzes yellow, one of my quizzes blue, and left the quiz as the default white. Now that I have my quizzes tagged in the appropriate colors, I can easily filter the quizzes displayed to me using the color options to the right of the Listing Filter. This can become particularly useful if you have many quizzes that you needed to easily sort. In my case, I might have decided that red quizzes are on the subject of history, while yellow quizzes are on the subject on math. If I only wanted to display history quizzes (in my case red quizzes) – I’d simply uncheck the boxes next to each of the colors that I did not want to display, while leaving the color(s) I want to display checked. I can also set it to display multiple quiz colors at the same time. For instance, if I wanted to display history and math quizzes (red and yellow), I would check the boxes next to both red and yellow at the top while leaving the other colors unchecked. 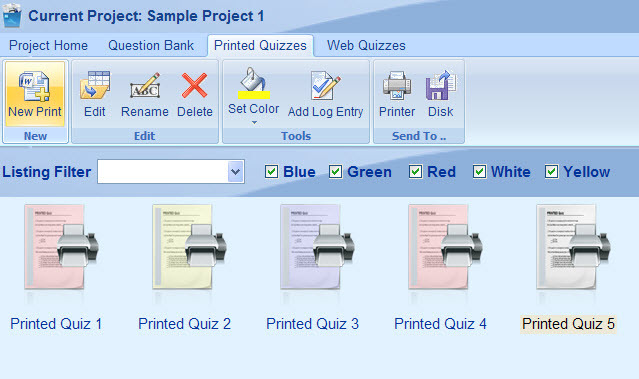 Color Tagging can be used on both Printed and Web quizzes. 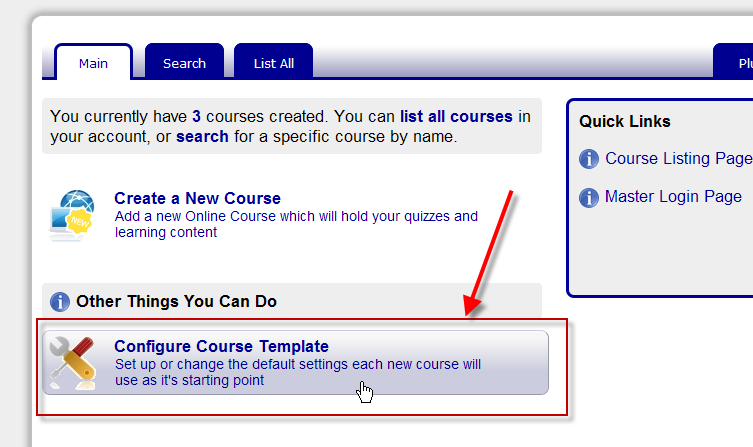 Weblearning 9.5 has added a lot of new functionality to enhance and customize your quizzes and courses. In Weblearning 9.5 you now have three different methods you can utilize to present unique quizzes to each and every one of your students. This can be particularly useful if your in a testing enviroment where students are completing their course work side-by-side. 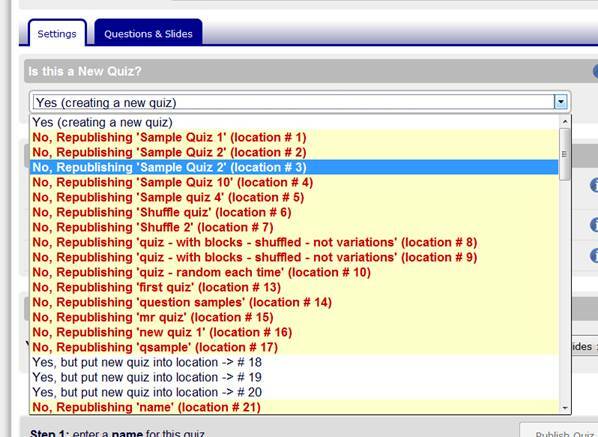 Instead of those students seeing the same quizzes in the same order (making cheating or cooperation much easier), you can configure your quizzes to display questions in a shuffled order, display the answers to those questions in a shuffled order, or even display a different set of random question altogether for the same quiz. The first method we’re going to discuss is Question Shuffling and how to use it. Question shuffling allows you to present your questions in a different random order each time the quiz is started. If using the question shuffling method alone, your students are still going to get the same set of questions each time they take the quiz, however they will appear in a different random order each time the quiz is taken. 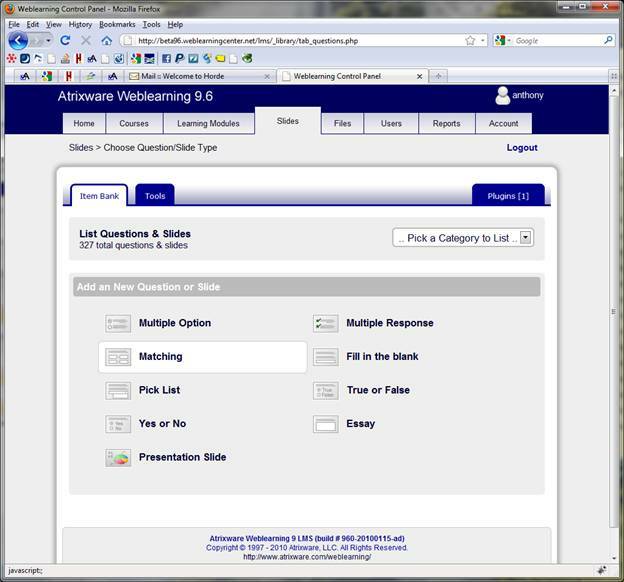 The first step in setting up your quizzes to shuffle questions is to head over to the Quizzes & Modules tab inside of your Weblearning Course Admin. Find the quiz where you would like to shuffle questions for and then click the Properties button to the right of that quiz. This will bring up the Quiz Properties screen for that quiz, under the General Settings subtab. Scroll down until you see the box that says Shuffle Questions (about 3/4 down). To the right of where it reads Shuffle Questions is a dropdown box – to set your quiz to shuffle the questions, select Yes – shuffle each time from the dropdown. Once you’ve made that change, scroll to the bottom of the page and click the Submit Changes button to save your changes. You can also configure your quizzes to shuffle the questions in your default publishing settings. By doing this, every quiz you publish/republish from that point forward will shuffle the questions each time the quiz is taken. To do this, we’re going to click on the Quizzes & Modules tab again, but this time we’re going to go over to the Settings subtab. 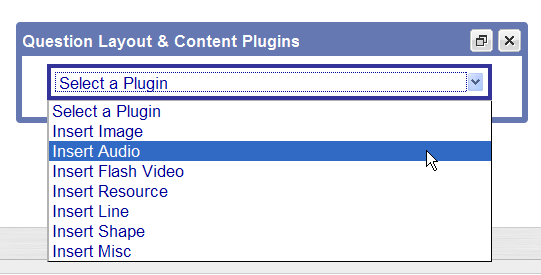 Once on the Settings subtab, click the link that reads Setup Publishing Defaults for All Modules. 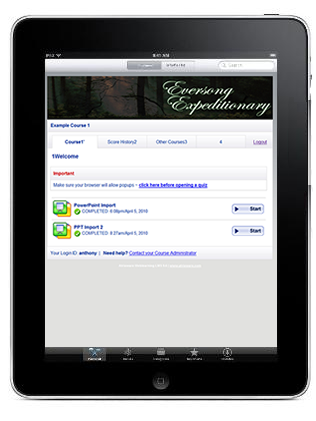 This area allows you set up the default settings that are used each time you publish/republish a new or existing quiz. Click on the Functional Settings subtab to shuffle questions in all your quizzes from here on out. The third option down underneath the Functional Settings subtab is the Shuffle Questions option. Select Yes from the dropdown box located to the right, then click the Submit Changes button at the bottom of the page to save your changes. The next thing we’re going to talk about is Shuffling the Answers to your Quiz questions. 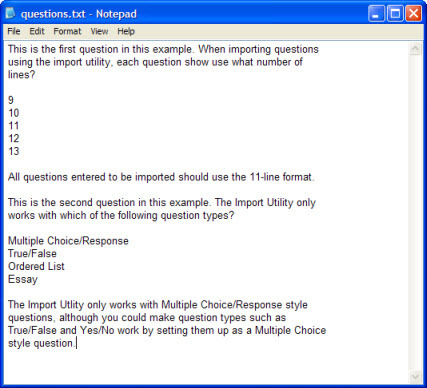 Answer shuffling can be applied to Multiple Choice, Multiple Response, True/False, and Yes/No style questions. It cannot be applied to Fill-in-the-Blank, Essay, Matching, or Pick List style questions. Unlike question shuffling, Answer Shuffling can only be applied on a question by question basis instead of in one setting across a quiz. To get started with Answer Shuffling, click on the Questions & Slides tab and Add a NEW Question from one of the compatible question types listed above. Once you’ve selected the question type you’d like to work with, the Question Editor will come up where you can enter your question, answers, set the question category, etc. The area of the question editor we’re interested in falls directly underneath where you enter the choices/responses for your question. Check the box to left of where it reads Check this box to shuffle the answer order each time. Once you’ve completed creating your question (entering the question text, the choices, selecting to shuffle the answer, and assigning a category) click the Add Question button at the bottom of the editor window to save your question. The same idea can be used to add Answer Shuffling to your existing questions by bringing up the questions in the Question Editor and then checking the box below the choices/responses. Remember adding answer shuffling is the same as editing on your questions, so in order for those changes to take effect in the quizzes that your end user will see, any quizzes that contain those questions need to be republished. The last thing we’re going to discuss is a brand new feature in Weblearing 9.5 which gives you the ability to create quizzes that pull from the same set of questions, but do not use the same exact questions every time the quiz is taken. The feature we’re talking about is Quiz Variations. You can set a quiz to use quiz variations each time you publish and new quiz or republishing one of your existing quizzes. 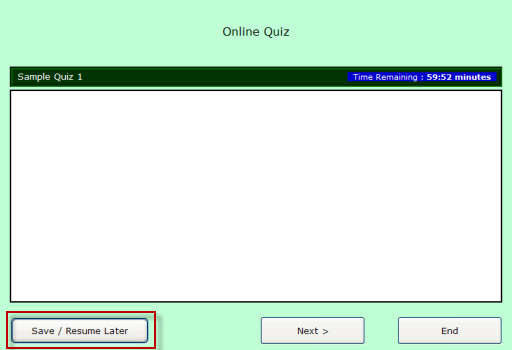 For this example I’m going to show you how to configure a quiz to use variations by creating a new quiz. The first step is to go to the Quizzes & Modules tab. From there, click the topmost link below the subtabs that reads Create a New Graded Quiz. This will bring up the Publish a Quiz Screen, where you can enter the title for your quiz, select the categories and number of questions from those categories you would like to use, set a time limit for your quiz, and enabled Quiz Variations for your quiz. What quiz variations essentially does is tell the quiz that each time it’s started to repeat the same set of question selection rules over again. So if you initially configure to quiz to use 10 random questions from Category A, 10 random questions from Category B, and 10 random questions from category C – each time a student takes that quiz the quiz will pull 10 random questions from each of those categories. It’s important to note that for quiz variations to properly function, there should be more questions in the category than the number you are pulling. Otherwise, each time the quiz pulls the question it’s going to end up pulling ALL the questions from the category, which defeats the purpose of using variations. 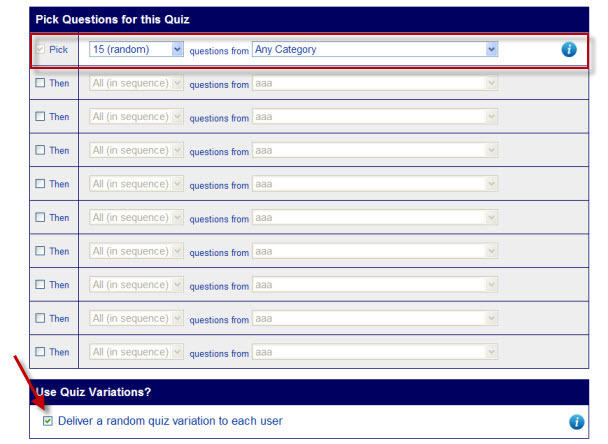 In the example above, I’ve set my quiz to use 15 random questions from all my question categories. Since I have nearly 200 questions available, each time the quiz is started 15 random out of those 200 available will be selected and displayed to the user. I’ve also made sure to check the box to the left of Deliver a random quiz variation to each user to turn on the quiz variation feature. Once I’ve finished creating my quiz and configuring it to function the way I would like it, I’ll click the Publish Quiz button at the bottom of the screen to create my new quiz. Each of the aforementioned features can be used alone or in conjunction with one-another. Using Quiz Variations, Question Shuffling, and Answer Shuffling together gives me the most power, allowing me to create quizzes that use different sets of questions, displayed in random order, with the answers themselves displayed in random order – making it less likely that two students can recieve the same exact quiz. One of the best features added in Weblearning 9.5 is the ability to allow students to pause a quiz and then resume taking that quiz at a later date. 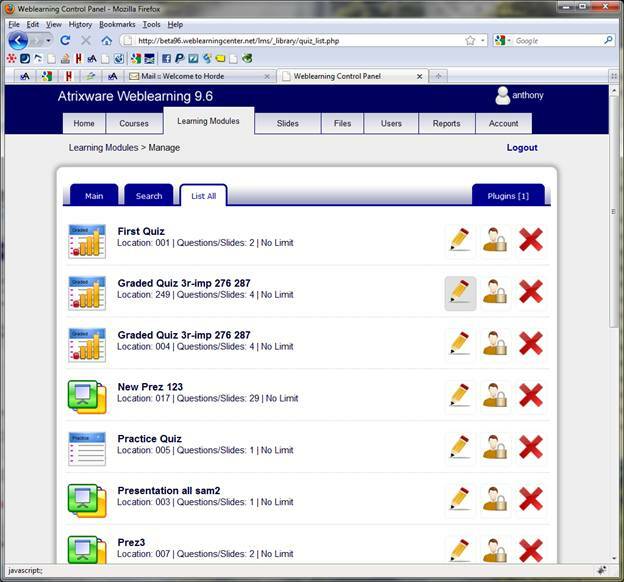 In previous versions of Weblearning students were required to start and finish a quiz in one sitting. If for some reason they could not finish the quiz at that time, they either had to exit and restart the quiz at a later date, or end the quiz and any remaining unanswered questions would be marked incorrect. In this article I’m going to show you how easy it is to enable the Pause/Resume feature on one or all of your quizzes just by adding one line of CSS. 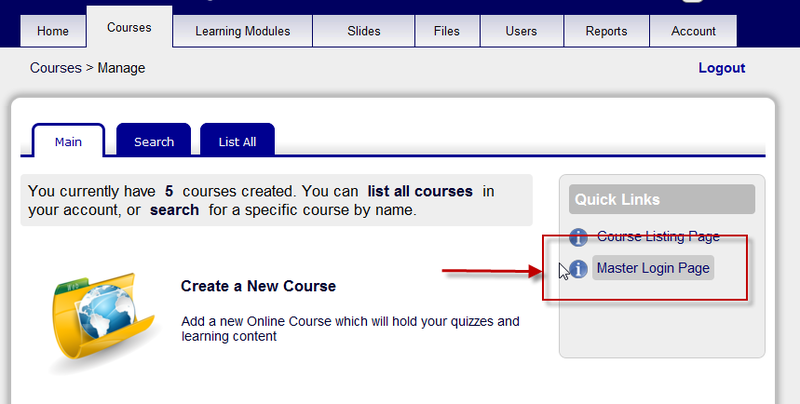 To add the Pause/Resume button to one exisiting quiz, start out by heading over to the Quizzes & Modules tab in your Weblearning Course Admin. 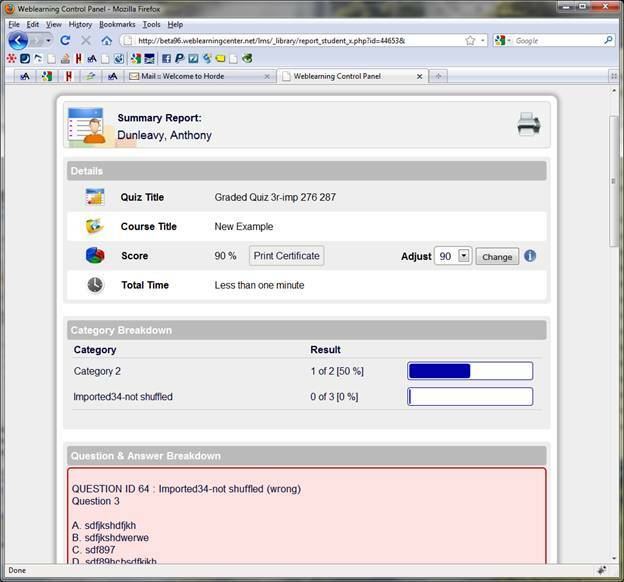 On the Quizzes & Modules screen you can view all of your Graded Quizzes, Practice Quizzes, and E-learning Presentations. To proceed, simply find the quiz that you would like to add the Save and Resume Later button to and click the Properties button located to the left of the Quiz title. 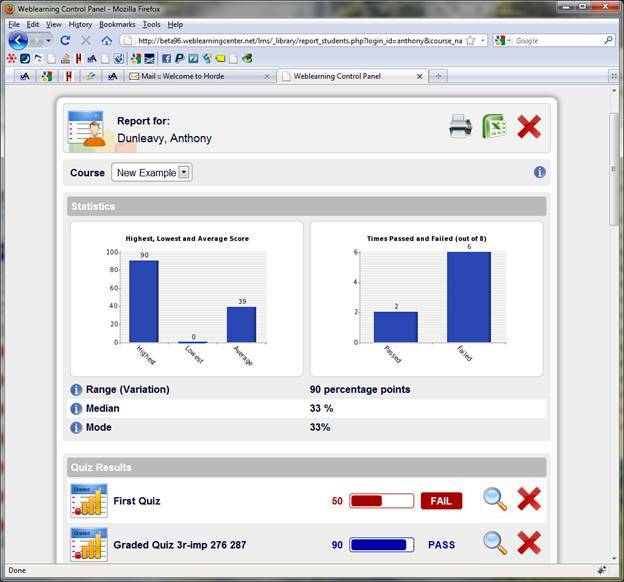 The Quiz Properties screen allows you to configure everything from the functionality of the Quiz, to it’s appearance, to the emails and pages displayed to and your students upon completion of the Quiz. 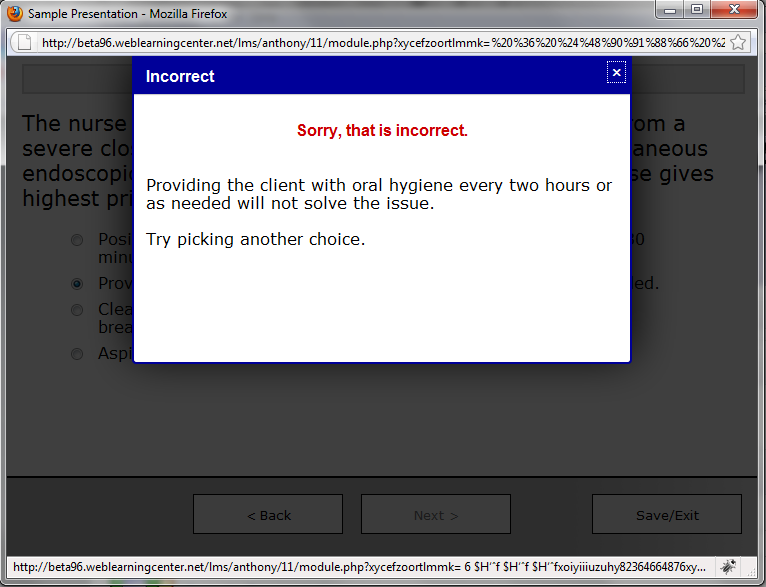 For our purposes, we want to edit the CSS for this quiz and enable the display of the Save and Resume Later button. To do that, click on the Advanced Settings subtab. 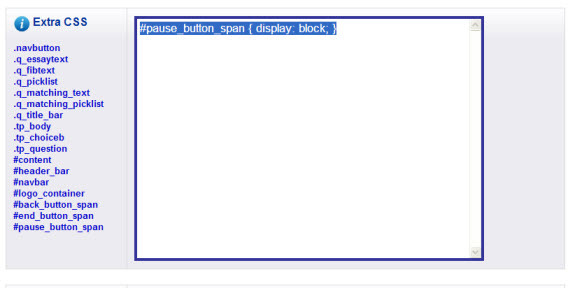 Once you’ve added the line of CSS to the Edit CSS box, scroll down to the bottom of the page and click the Submit Changes button to save the changes you have made. Now, when any of your students start that quiz, they’ll see a Save and Resume Later button in the lower left corner of the quiz that will allow them to pause and restart the quiz at a later date, without having to either start the quiz from scratch or submit their quiz for grading while incomplete. When a student clicks on the Save and Resume Later button, they will be notified that is OK to close the quiz and the main screen for the course will be updated to reflect the quiz status. Note: If you have imported Quizzes from a version of Weblearning prior to 9.5, you need to republish those Quizzes in Weblearning 9.5 before the Pause / Resume feature becomes available for those quizzes. After our users have created a package with Package Wrapper, many of our users to choose to distribute there packages via CD-Rom. A question we’ve been asked in the past is how to burn the CD-Rom so that the packaged EXE file will start automatically. Depending on what burning software you use (Roxio, Nero, etc.) it is possible to set a specific file to ran automatically. However, for the purpose of this tutorial I’ll be going over a different method that can apply to any burning software, including the burning functionality that is included in Microsoft Windows. Autorun.inf is a file that is stored in the root directory of your CD-Rom. It tells the computer the location and name of which file to run when the CD-Rom is inserted into the drive. What we’re going to do is create our own autorun.inf using a text editor such as notepad that we will be burning to CD along with our package EXE file. The first step is run Notepad from either inside of the Start menu or via the Run Dialog (notepad.exe) in Microsoft Windows. Where filename.exe is the name of the executable file that you created in Package Wrapper and plan to burn to CD-Rom. In the example above, the name of the package I created in Package Wrapper would be mytest.exe. Once you’ve entered the lines into notepad, simply save the file to the same folder where your package EXE file is stored with the filename autorun.inf. When you are ready to burn your software to CD, all you need to do is burn both your packaged executable file and the autorun.inf file. When your user inserts your CD-Rom into there computer, your package should start automatically. NOTE: Microsoft Windows allows the user to disable the autorun feature. That means that even if you create the CD-Rom so that your package will start automatically, it will only do so on systems where the feature has not been disabled. For more information on creating and using the autorun.inf file, you can view Microsoft’s How-To for a wealth of information: http://support.microsoft.com/kb/818804. 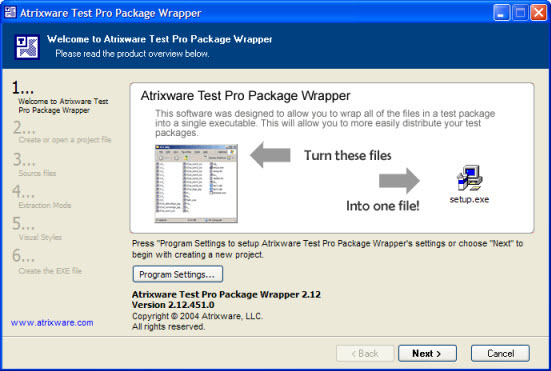 Package Wrapper is a powerful tool for easing the distribution and install process of E-learning software for you and your users. While some of you might have used Package Wrapper in the past, you might not realize the amount flexibility that exists in customizing what your end user sees. In this tutorial, I’ll be showing you the different ways you can customize your package in Package Wrapper. Once you’ve gone through the first four steps of creating the package, you’ll get to Step 5: Visual Styles, which is the area I’ll be working in for this tutorial. The first thing I can modify in the Visual Styles is what the user will see when they first run my package. 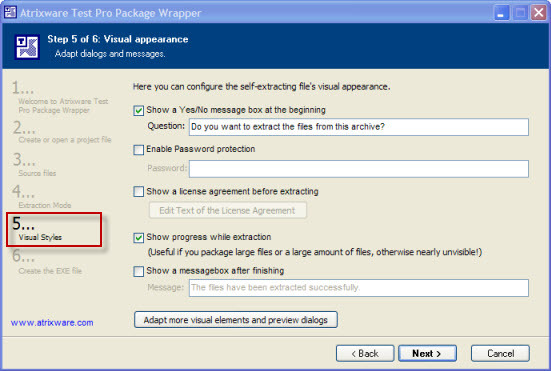 By enabling Show a Yes/No message box at the beginning , the user will be prompted on whether or not they want to continue the installation of the package. You can change the wording of the display by entering your own text in the Question field. The next option is Enable password protection. Enabling password protection allows you to require the user to enter a password before they continue installation of the package. You can define the password in the Password field. If you do not use any form of piracy protection on your Elearning packages, this might be one way to give your packages a small amount of protection. If you’re package is of considerable size, you might want to enable the Show progress while extraction option to display a progress bar to the user that alerts them that the software is still actively installing. Even if your package isn’t all that sizable, this may be an option you would choose if some of your users might be installing on older, slower systems. The last option we have on this screen is Show a messagebox after finishing. After your files are done extracting and prior to executing the file that you may have set up to run after extracting, this message will be displayed to your users. You can edit the text of the popup message in the Message field. Clicking on the Adapt more visual elements and preview dialogs button on the Visual Styles will bring up the Language Editor. From here you can change the text for the rest of the elements of your package, as well as get a preview of what they will look like when compiled. From the General tab, the first thing you can do is set the caption that is displayed in the titlebar of all your popup dialog windows. Underneath that you can edit the text displayed on the various buttons within the package. By entering the & character before a certain letter indicates that letter being the keyboard shortcut for that button. For example, by default the Yes button is set as &Yes, and in my package it would display as Yes, with Y being the shortcut key. If I were to set the Yes button to Ye&s instead, my packages would display Yes, with S being the shortcut key. The Welcome Message Box tab of the Language Editor edits the same text that is set when you enable the Show a Yes/No message box at the beginning option from the Visual Styles screen. By clicking on the Test Dialog button, you can see exactly what the dialog will look like when it is in action. The Password Protection screen allows you to edit what is displayed to the user if you have required them to enter a password prior to extracting files. The Bold Heading is what is displayed at the very top of the dialog, in a white heading bar. The Heading Subline is displayed in a smaller font, directly underneath the Heading in the same white heading bar. Finally, the Text above password field is the main message of the Password Protection dialog, displayed directly above the box where the user enters a password. 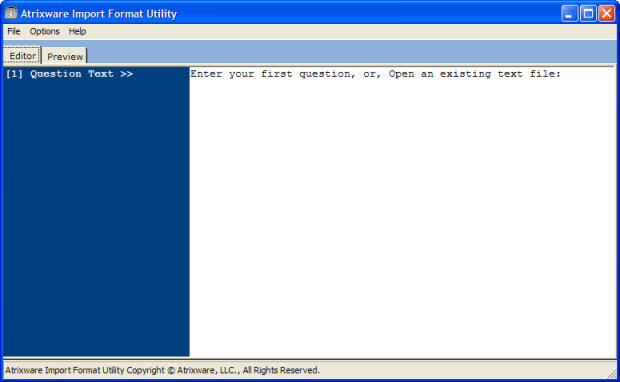 Clicking on the Test Dialog button will show you a preview of what this dialog looks like in action. Under the License Agreement tab you can edit what is displayed to the user when viewing your license agreement (if you’ve enabled the option to display it on the Visual Styles screen). The Bold Heading is the text that is displayed at the very top of the dialog, in a white heading bar. The Heading Subline is displayed in a smaller font, directly underneath the Heading in the same white heading bar. The Text below license agreement is what is displayed underneath your license agreement (which you can set on the Visual Styles screen). Again, clicking on the Test Dialog button will give you a preview of what this dialog will look like in your completed package. The Select Extraction Path tab allows you to configure the text displayed if you allow your users to choose a path where your package will be extracted. The Bold Heading is the text that is displayed at the very top of the dialog, in a white heading bar. The Heading Subline is displayed in a smaller font, directly underneath the Heading in the same white heading bar. 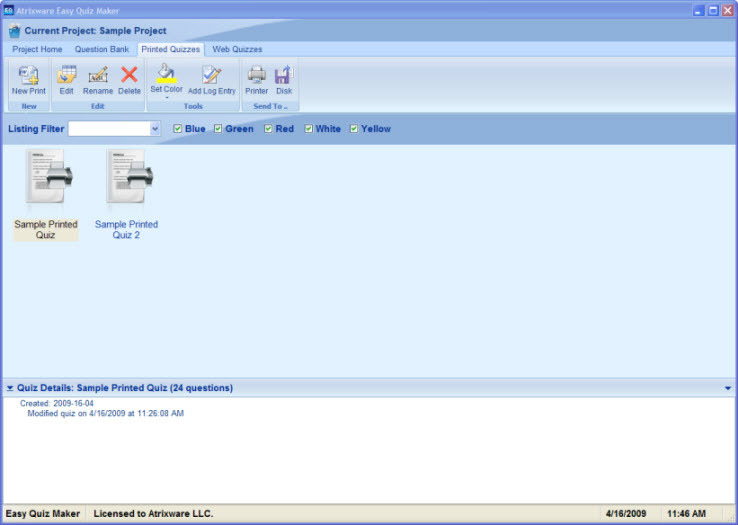 The Text above path name is the text that instructs the user what to do next, displayed directly under the white heading bar and above the folder selection bar. The Text on folder select dialog is the text that is shown at the top of the folder navigation dialog that is displayed when the user clicks the Browse button to select an install folder. Clicking the Test Dialog button will display a preview of what this dialog will look like (including when the user clicks the Browse button) in your package. The Progress Dialog tab allows you to configure what is displayed to the user if you selected to display a progress bar during extracting. The Bold Heading is the text that is displayed at the very top of the dialog, in a white heading bar. The Heading Subline is displayed in a smaller font, directly underneath the Heading in the same white heading bar. The Text above progess bar is the text displayed directly below the white heading bar and above the progress bar. The Warning Messagebox when pressing the Cancel button configures what Yes/No popup that is displayed to the user if they click the Cancel button while the package is still installing. As always, click on the Test Dialog button will show you a preview of what your completed Progress Dialog will look like. The last tab we come across is the Finish Messagebox tab, while is displayed to the user when the package is finished extracting (if you enabled the option in the Visual Styles tab). The text that you can edit here in the Finished message field is the same text that you can edit in the Show a messagebox after finishing section of the Visual Styles screen. Once you’ve completed configuring the text for all your dialogs, simply click the Close button and you can proceed to finishing up with wrapping your package. 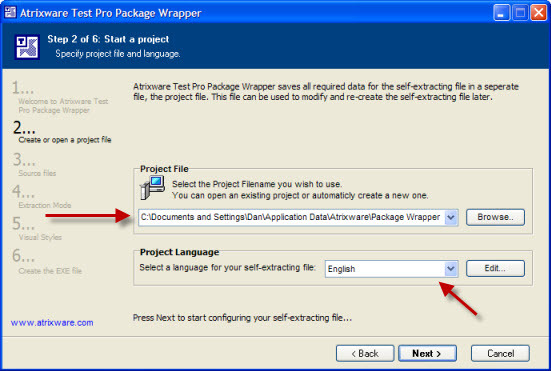 With Package Wrapper it is possible to customize what is displayed to the user during installation, whether it be consistent with your E-learning packages or in the language of you or your end user. When creating an ELearning Package with Test Pro Developer, the end result is a bunch of files that some users might have difficulty installing. To make installation easier for your end user, as well as add an additional sense of professionalism to your final product, you can wrap your files with Atrixware Package Wrapper. In this tutorial, I’m going to show you how to wrap a package using Package Wrapper that is compatible with Microsoft Windows 2000, XP, & Vista. The first screen I see after launching Package Wrapper is the Welcome screen, where I can see what Package Wrapper I am using and modify the global settings. By click on the Program Settings button, I can set the default path where my project files, output files (this is the final package .exe file), language files, and icon files are stored. For the purposes of this tutorial, I’m going to leave all of these as the default settings. Click the Next button will bring me to Step 2: Create or open a project file. When creating a package I have the option of saving my settings as a project file so that if the need arises to create the package again, I can create it with the same settings I used before. 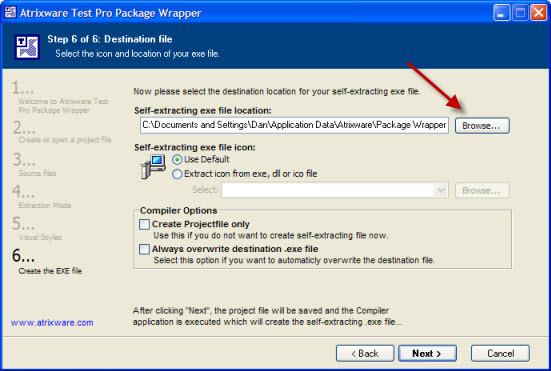 In this example I’m going to allow Package Wrapper to create a new project file. I can also choose or edit the Project Language by either selecting one of the pre-defined languages from the dropdown or by selecting and clicking the Edit button for any of the languages. For this example I’m just going to leave the Project Language as English. Clicking on the Next button will take me to Step 3: Source Files. This is where I want to add the files for the package I created in Test Pro Developer. 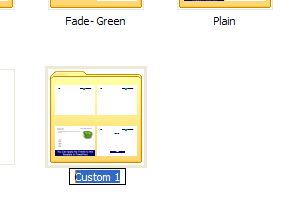 Clicking the Browse button will bring up the Browse For Folder window where I can select the folder that my Elearning package has been saved to. To find the folder where my files have been saved, I can run Test Pro Developer, go to the Build and Deploy (or Packaged Tests if you’re using Test Pro Developer 8) section, and find the option to View Files. This will bring up a Windows Explorer window with a view of the all the files we’ll be adding into Package Wrapper. Once I’ve found the folder where my files are stored, I’m going to click the OK button. All the files from my project should now have been added into the Source Files List. Click the Next Button will take me to Step 4: Extraction Mode. The first thing I want to do is select Normal mode (extract files) for the mode of the package. By default most people use %programfiles%\MyApp as their Default Installation Directory. However, to ensure that the package installs properly in Vista I want to change this to %temp%\MyApp. I also want to make certain that Automatically Extract Files is selected, rather than have the user select the folder where the package files will be stored to make the process as easy as possible. 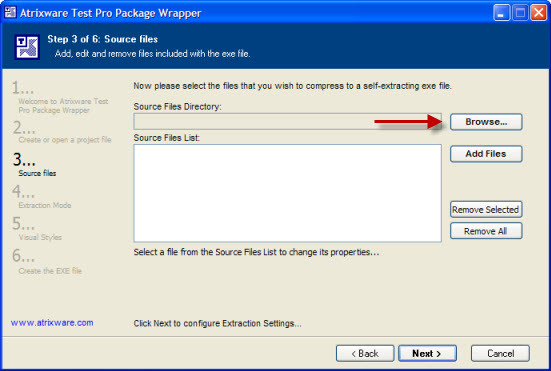 The other option I want to make sure I have selected is Execute a file after extraction. This tells the package that as soon as it’s decompressed it’s files, to run the the E-learning software install. If I did not select this option, the program would end after the files were extracted and my users would have to browse through their computers until they found the E-learning software install file. Using the dropdown, I want to select the file %appfolder$\setwiz_i.exe as the File to be executed after extraction. Clicking the Next button will take me to Step 5: Visual Styles. In this section I can choose what you want to be displayed to the user during extraction of my package. Not only can I choose what dialogs I would like to display to the user, but I can customize the text for them either directly within this window or by click on the Adapt more visual elements and preview dialogs button. For the purposes of this tutorial, I’m going to leave everything as the default setting. If you would like more information on customizing your packages, you can find more information via the online manual or by reading the Package Wrapper blog article on customization. 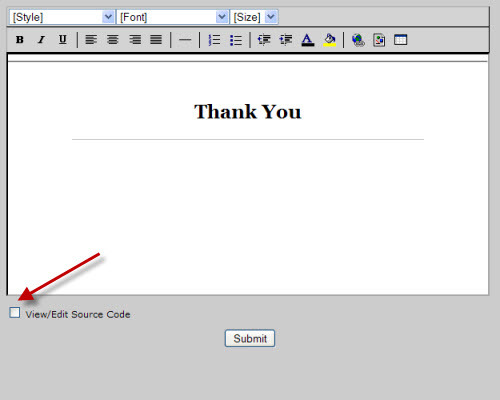 Click the Next button will take you the final step, Step 6: Create the EXE file. By default, the path where my package is saved might be difficult for me to find later. By clicking the Browse button, I can select to save the final EXE file anywhere on my hard-drive. Once I’ve found the folder where I would like to save my package all I need to do is enter a filename and click the Save button. This will place the path I have chosen and filename into the Self-Extracting exe file location box. 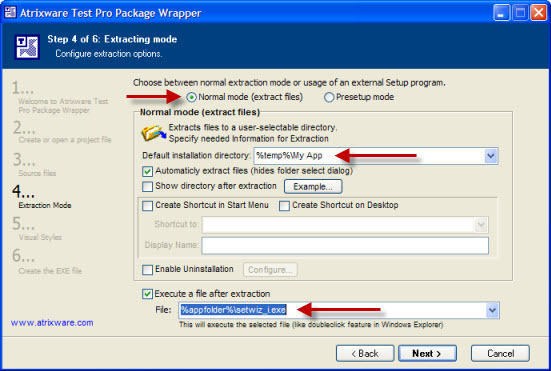 Clicking the Next button one last time will create my package and save it to the folder and filename I specified above. Now all I need to do is distribute the package to my user, whether by burning the exe to CD, emailing it to my users, or placing it on my website for my users to download. 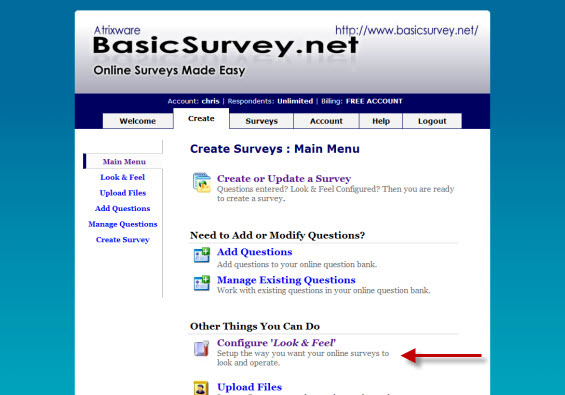 Basic Survey is easy online solution for creating and delivering online surveys. In previous tutorials, we’ve discussed how to to create your first survey, and customize the “look and feel” of your survey. 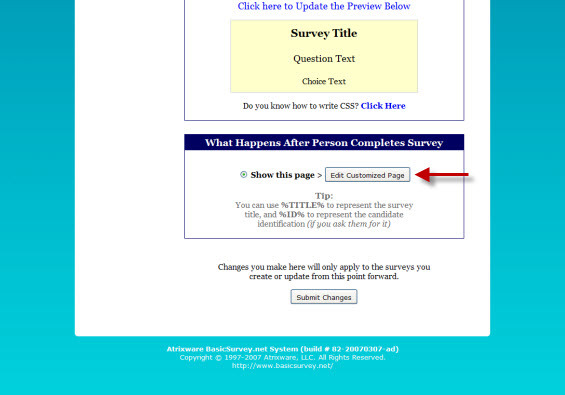 In this tutorial I’m going to show you how to customize the page that is displayed to the user when they have completed your survey. 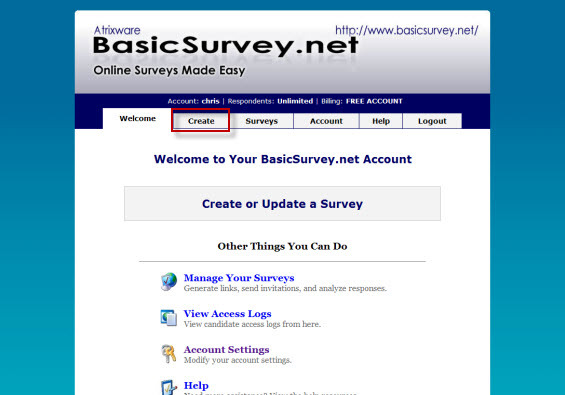 I’ll begin by logging into my Basic Survey account and clicking on the Create tab. This will take me the Create Surveys screen, where I want to click on Configure ‘Look & Feel’. From the Look & Feel page, I want to scroll down to the very bottom of the page and click on the Edit Customized Page button. The toolbar across the top offers me several options for customizing the response page. 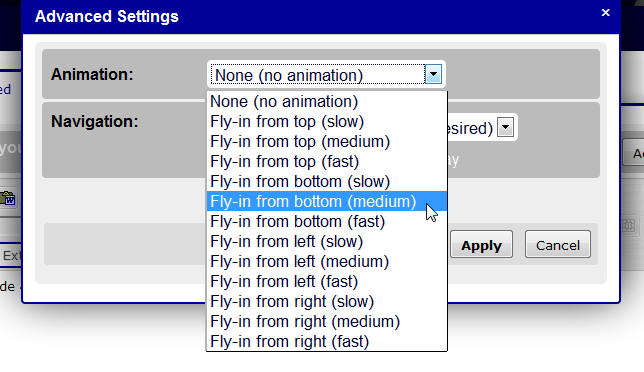 The top-most toolbar displays three dropdowns, the first of which is the Style dropdown. 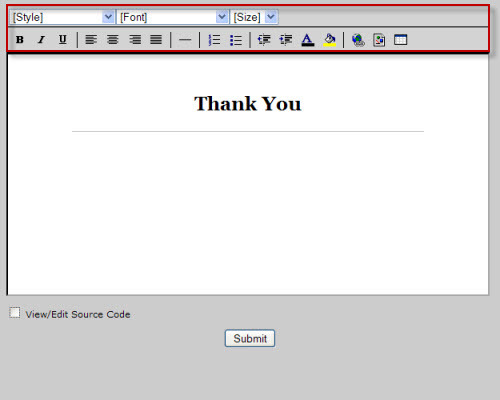 From here you can select the format of the text (the options will look familiar to anyone who has ever used HTML). 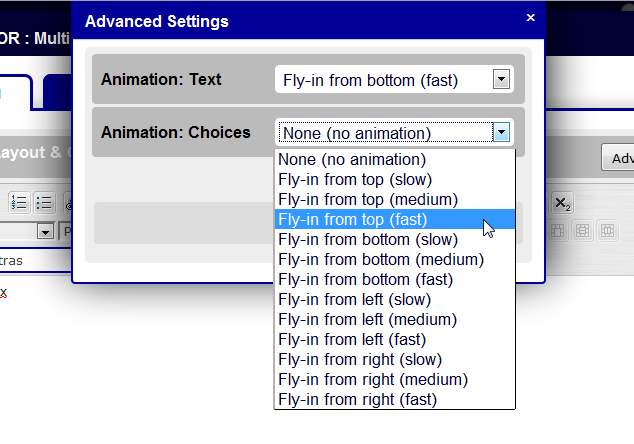 The second dropdown, Font, allows me to choose a specific font-face to use from a list of web-safe fonts. Lastly, the third dropdown, Size, allows me to set the size of the type. The second toolbar has several buttons that may look familar to you if you’ve ever used word processing software or a web editor. From left to right, I can bold, italic, or underline the text. I can set the alignment to either left, center, right, or justified. The next button is the horizontal rule, which places a horizontal line across the width of the page. 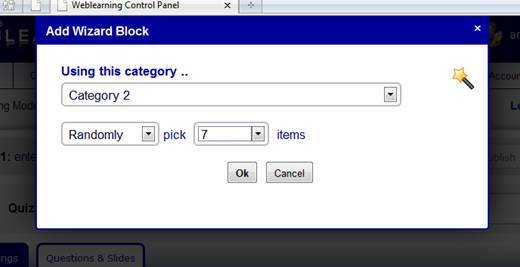 I can insert either a Numeric List or a Bulleted List by clicking on either of the next two buttons. The following two buttons will either Outdent or Indent the text. Next, I have the Font Color and the Background Color. Finally, the last three buttons will allow me to insert a hyperlink to a web page, an image, or a table all to help jazz up the appearance of my page. At the bottom of the editor, underneath the editing window itself, is the option to View/Edit Source Code. For those of you who know HTML and CSS, you can edit your response page source to even more customizing options, even blend your reponse page into your website. Once I’ve finished making my changes, all I need to do is click the Submit button and my changes will be saved. From here on out, when a user takes one of my surveys they will be thanked by the page that I’ve set up here.